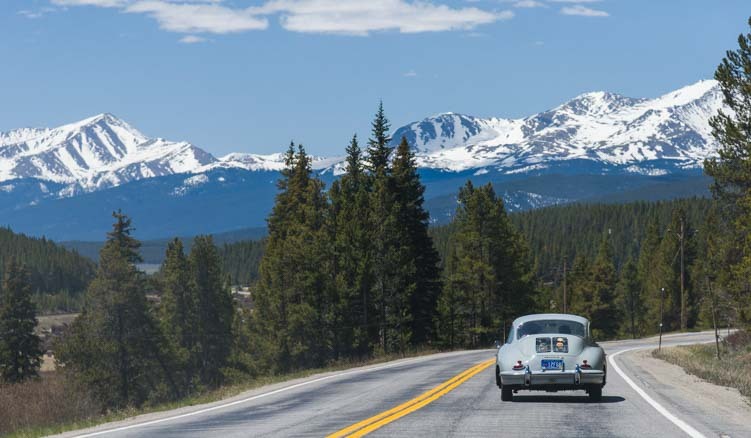 Colorado’s Stunning Scenic Drives…by Porsche! 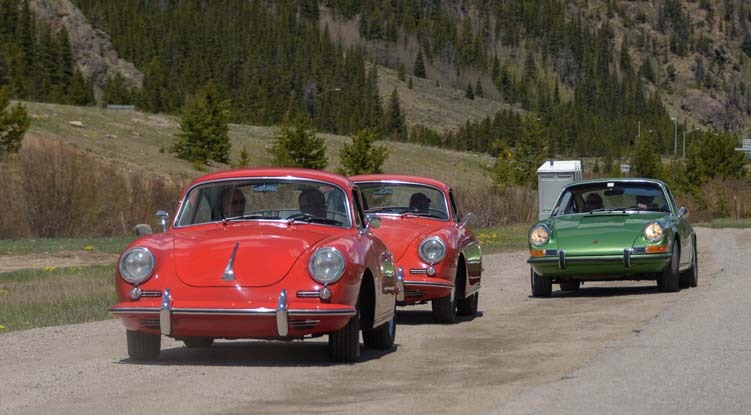 Back in June 2017, we took our RV into the Colorado Rockies and unexpectedly met up with a special friend of mine from high school the day she was hosting a rally for the Rocky Mountain Porsche 356 Club. Before we knew it, Mark and I had each hopped into a cute little roadster. 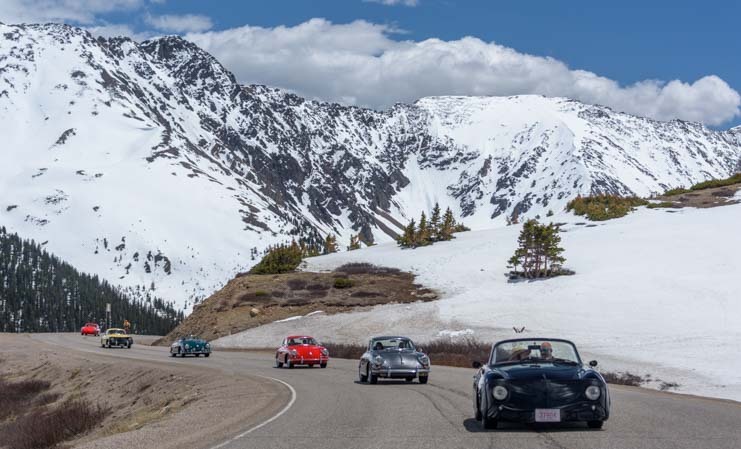 We arrived in Colorado just in time to participate in a Porsche 356 rally. 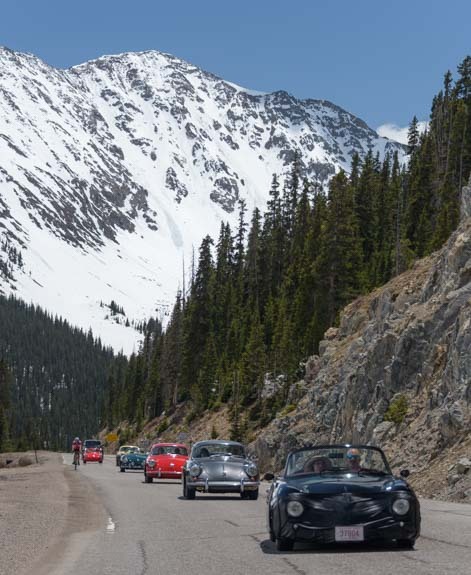 We started in Georgetown, Colorado, and once the group of twelve colorful vintage sports cars had gathered, we were off on a beautiful day of driving west of Denver through some of Colorado’s best mountain scenery. Colorful little roadsters ready for a ride! We did a big loop through some of Colorado’s most breathtaking scenery, starting in Georgetown. 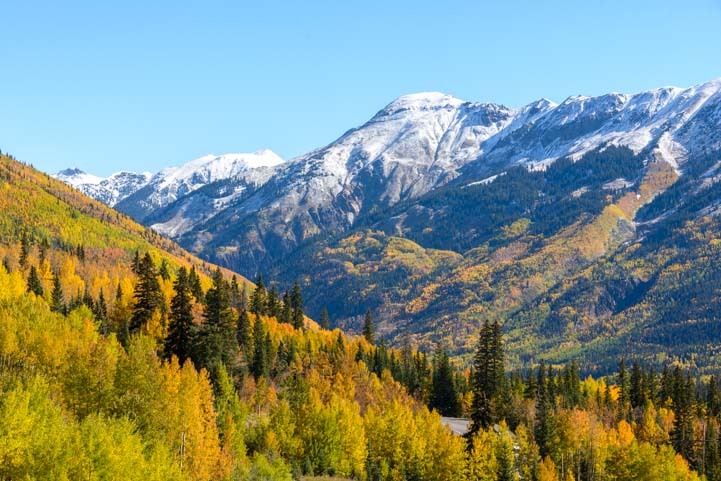 Our planned route would take us over four of Colorado’s big mountain passes: Loveland Pass, Vail Pass, Tennessee Pass and Fremont Pass. Almost as soon as we hit the highway, the snowcapped mountain peaks began to frame every view. 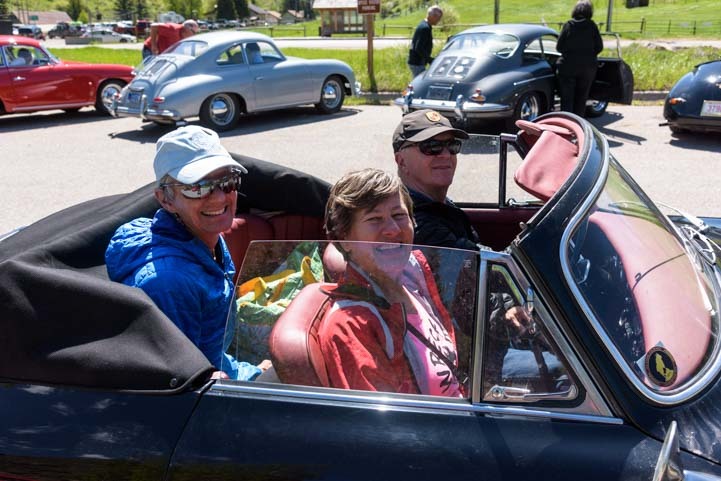 Happy drivers take their vintage Porsches for a ride. The Porsche 356 is a sweet little car that was made from 1948 to 1965. It has two seats up front and a tiny seat in the back. We switched our seating around a few times, and my favorite spot was that little back seat where I had a view of the mountains in every direction. I had a great view in all directions from the back seat. In June the mountains were still covered in snow. The best view was out the back, and I just snapped away with the camera while Mark rode in another car and talked with the driver about all things Porsche for a very happy few hours. What a place for a Saturday drive! It was a glorious late June day and the snow glistened in the bright, warm sun. We weren’t the only ones out enjoying the gorgeous roads and mountains scenery. 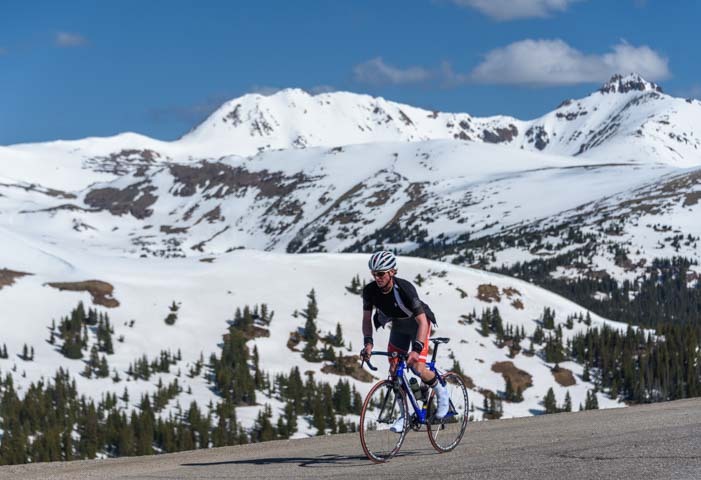 A cyclist crested Loveland Pass just as we did. It was a lot easier to get to the top of this pass in a Porsche! The snow was still surprisingly thick on the mountains, and at one point we even saw skiers zooming downhill at a ski resort. It was a blast to sit in the back seat and watch the line of Porsches snaking around all the curves behind us. At one point we all parked and got out to stretch our legs and enjoy the views. The mountains were lovely, but I got a kick out of seeing the back sides of all the Porshce 356s lined up in the parking area!! 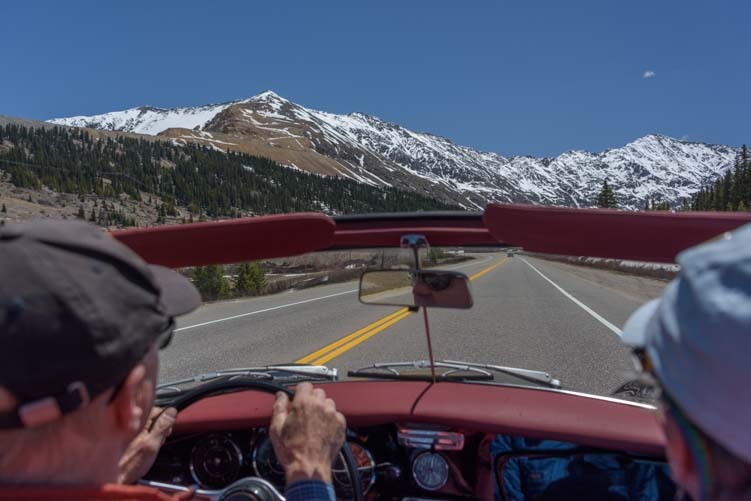 When we got back out on the road again, I was reminded of some of the really fun experiences we’ve had with sports cars out on the open road during our RV travels. 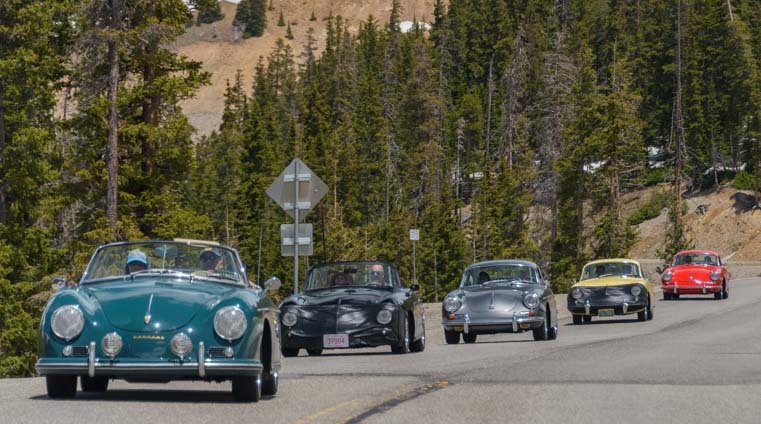 One of the best was the Idaho’s Sun Valley Road Rally, which takes place around the third weekend in July each year. 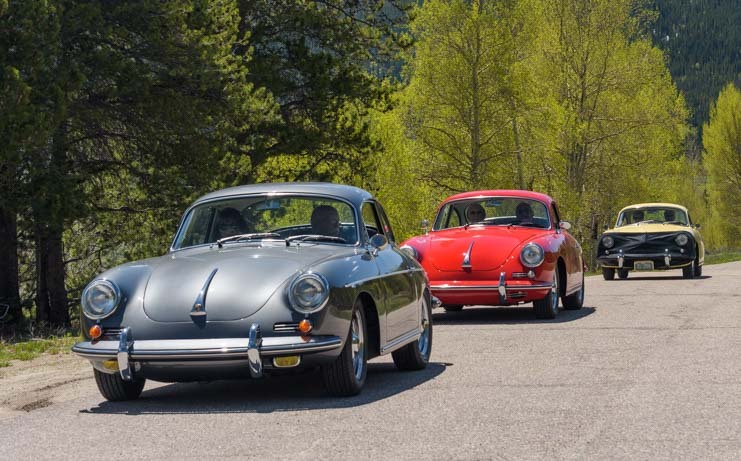 We were fortunate to see the second edition of the Sun Valley Road Rally in 2009 when four members of a family each raced the family Porsche down a straight stretch of the Sawtooth Scenic Byway, achieving higher and higher speeds. The son won the day with a top speed of 188 mph. 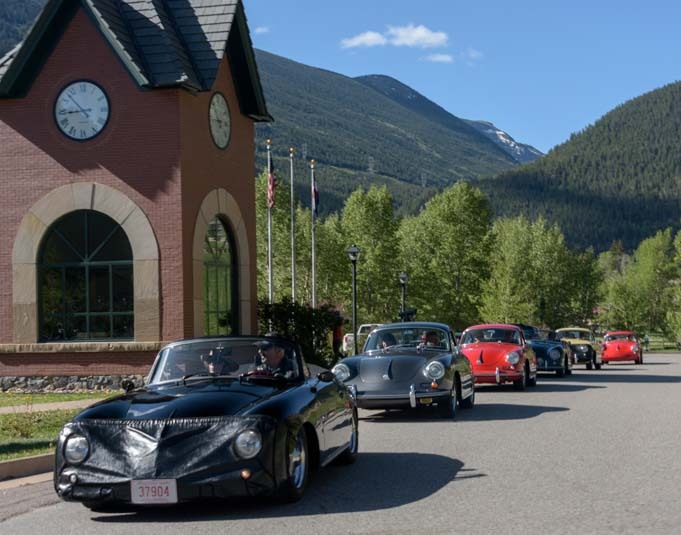 This fun Porsche rally brought back memories of other exotic car events on the open road. 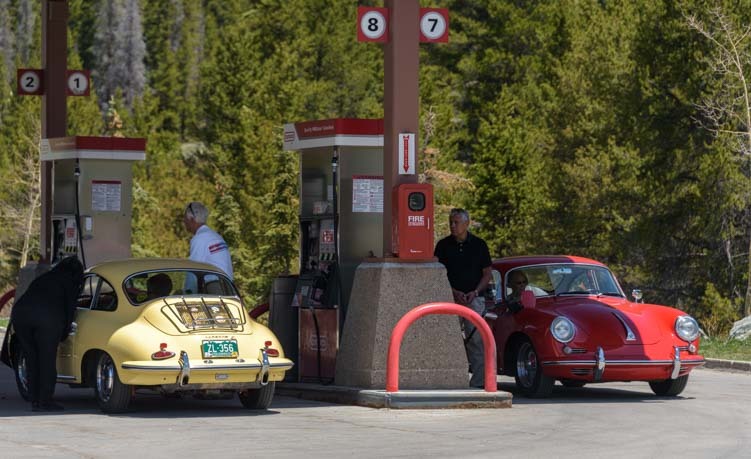 At one point our group of Porsche 356s had to stop and refuel. How fun to see all the Porsches taking turns at the gas station. But soon we were out on the road again, winding our way through majestic mountain views. 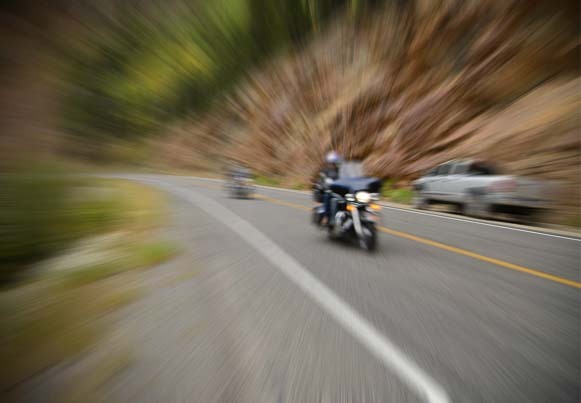 A few years ago, we saw the amazing Nevada Open Road Challenge which is held each May. 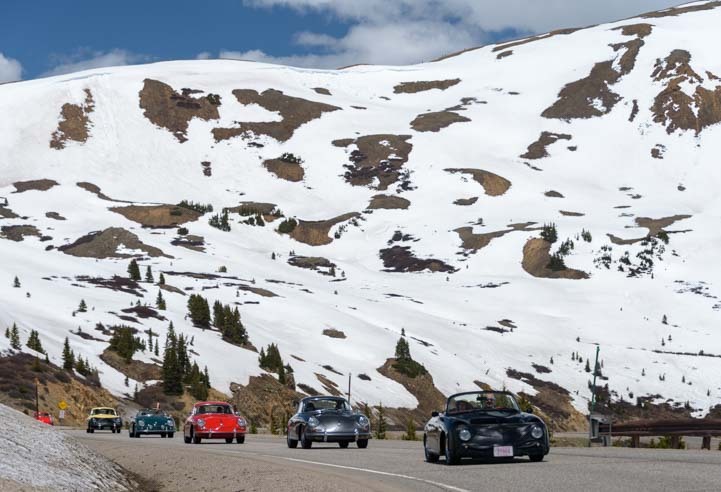 Sports car enthusiasts from all over brought some of the most exotic looking racing cars to Ely, Nevada, to race against the clock on 90 miles of back roads to Las Vegas. Just like the Sun Valley Road Rally, spectators are allowed to mingle with the drivers in the Nevada Open Road Challenge. What a thrill it was to see the drivers get suited up and take off in that race. It turned out that there are lots of opportunities for people to volunteer and help with the Nevada Open Road Challenge, and we talked with some of the folks about what a good time they had being a part of such an unusual car race. 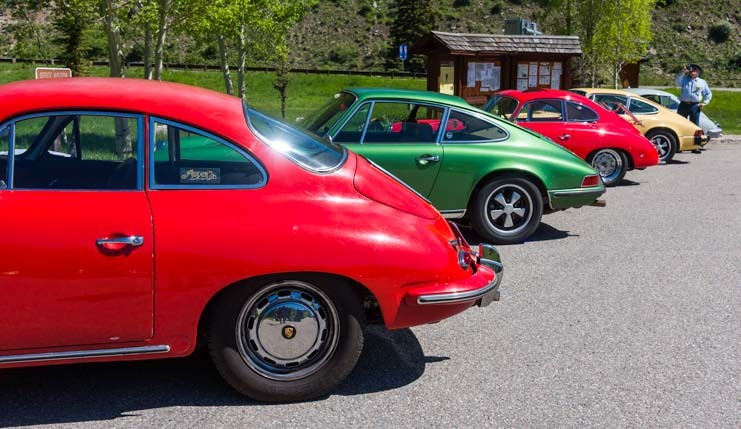 Near the end of our beautiful ride through Colorado’s Rocky Mountains, all the Porsches parked in a line for some photo ops. We were delighted to capture these colorful cars all in a row, and the owners proudly posed next to their cars for another round of pics. 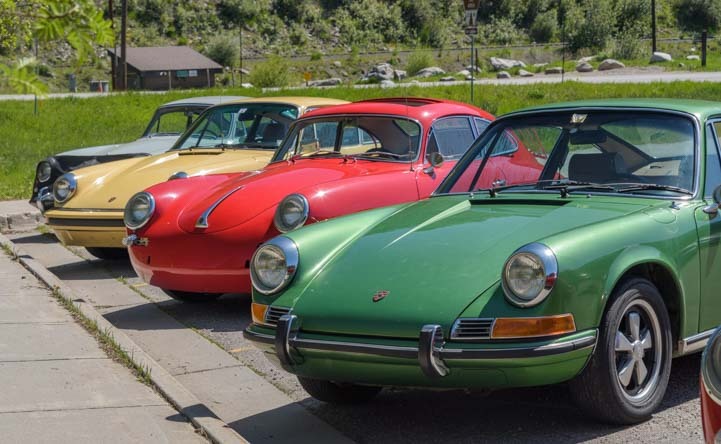 A rainbow of pretty Porsches. 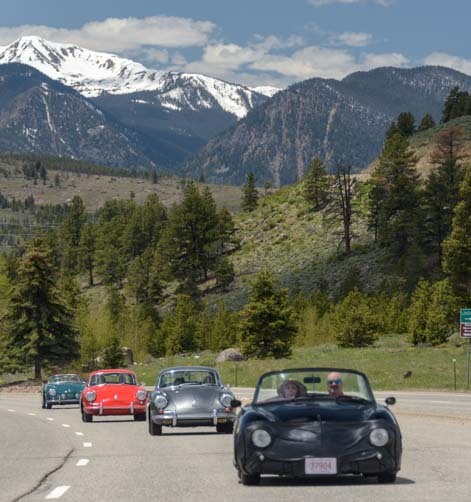 I can’t think of a better way to get an overview of the magnificence of Colorado’s mountain scenery than to hop in the back of a friend’s convertible Porsche 356 and drive all around the state for a day. What luck! 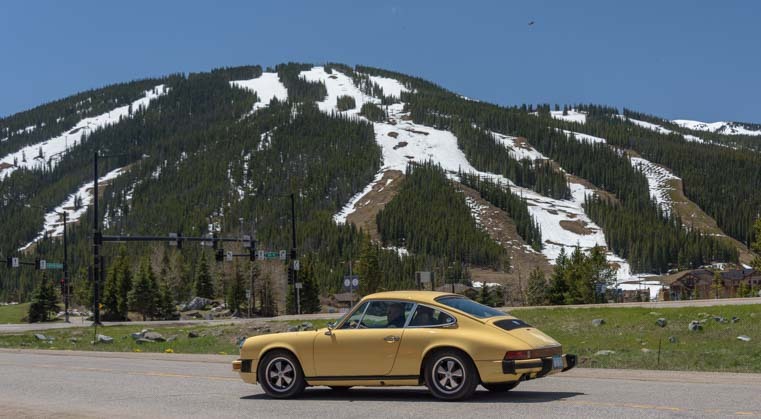 But even if you don’t have a friend who has restored a vintage Porsche to take you on an exquisite ride, this part of Colorado is stunning no matter what vehicle you’re in. A map of the route is below in the reference links. We never know where our travels will take us! 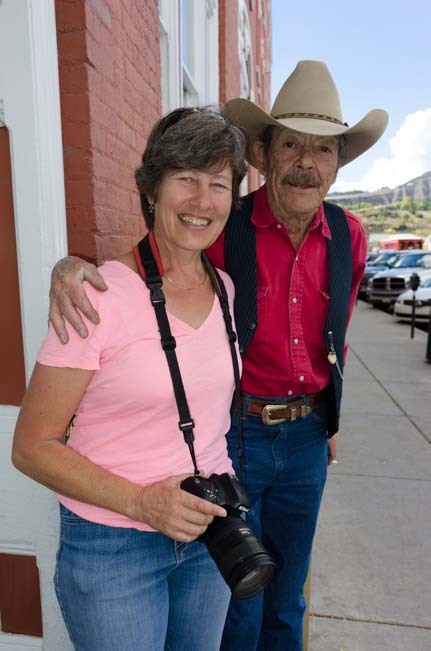 Cowboy Poetry Gatherings in Durango, Colorado, and Alpine, Texas! 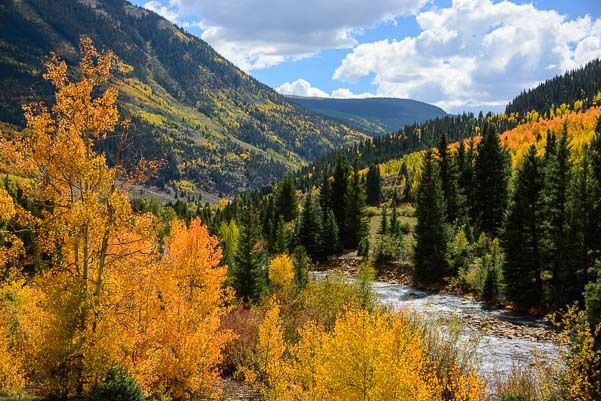 October 2016 – One of the stops for RV travelers on the beautiful San Juan Skyway is the town of Durango, Colorado. 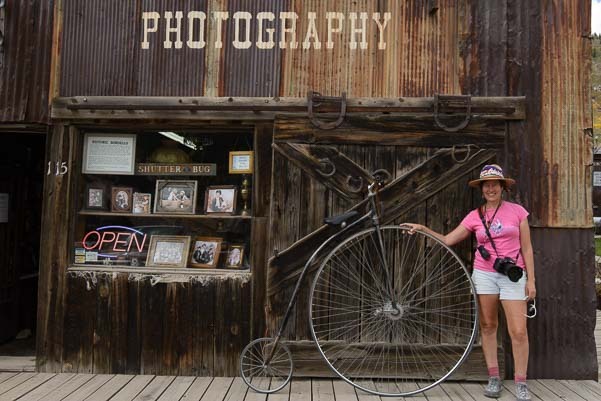 This is a fun mountain town that is loaded with history. 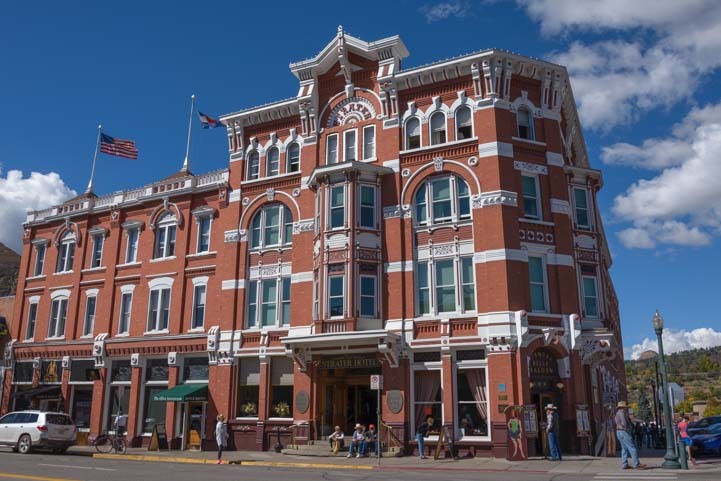 One of the most historic places in town is the pretty Strater Hotel. As we walked down the streets in the historic district, we saw a wonderful horse and carriage parked near a store. What fun it was to catch this rig a little later as it strutted down the road in front of the Strater Hotel! 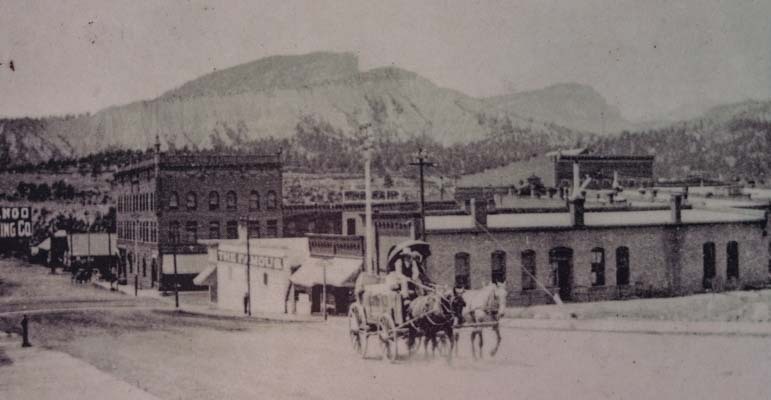 Of course, Durango in the 21st century is quite different than back in the 19th century. A plaque on a street corner gave us a feeling for what this same area looked like back in 1896. 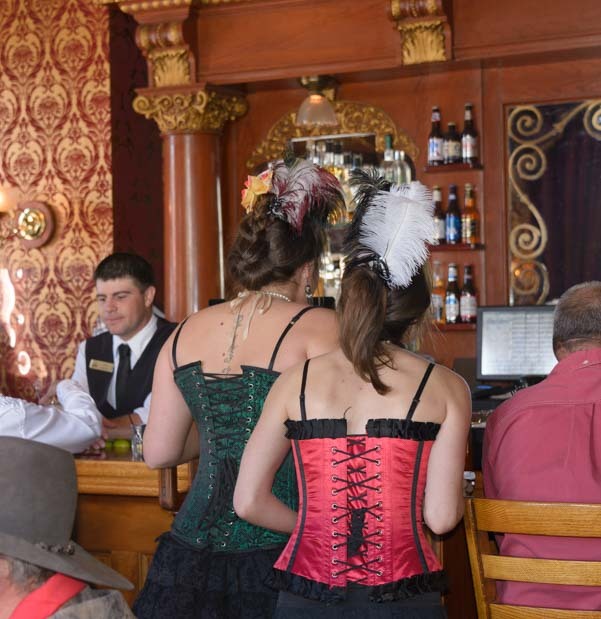 But the spirit of the old days is alive and well for Durango visitors, and I gave Mark a glimpse of what I’d look like as a barmaid at the famous Diamond Belle Saloon at the Strater Hotel. 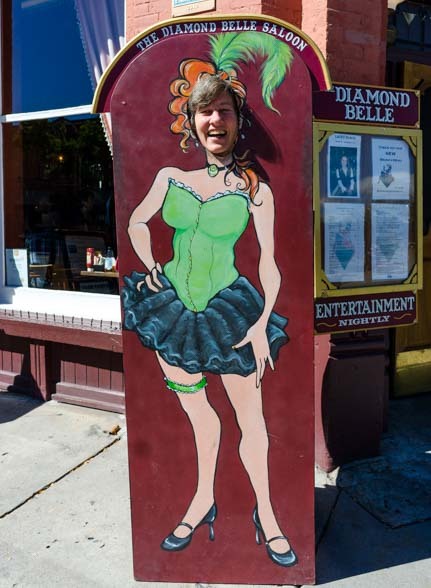 Once we got inside the Diamond Belle Saloon, we saw the real thing. Much prettier!! 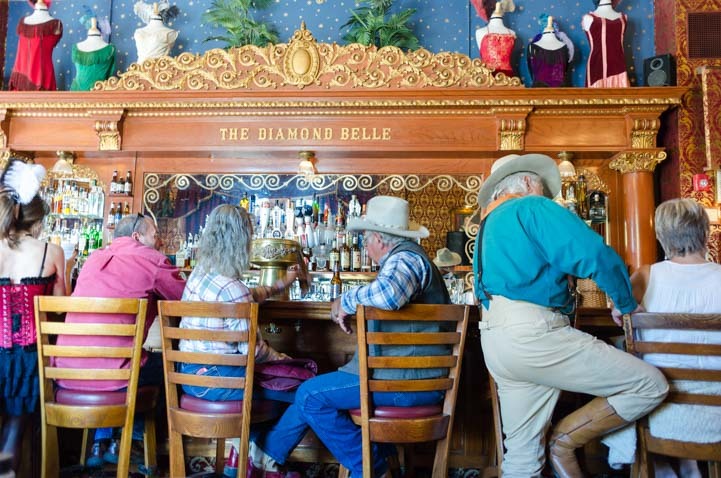 The Diamond Belle Saloon was absolutely hopping when we stepped inside, because the Strater Hotel was hosting the annual Durango Cowboy Poetry Gathering. 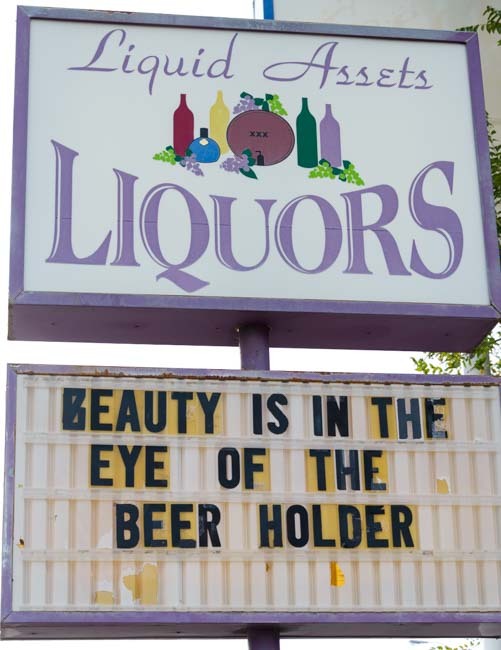 The barmaids were zipping between endless tables filled with cowboys, and the cash register was humming. Mark has a knack for getting pretty girls to line up for photos for him (check out our blog post from Spring Break on Daytona Beach years ago), and these lovely ladies were happy to oblige his request for a photo. 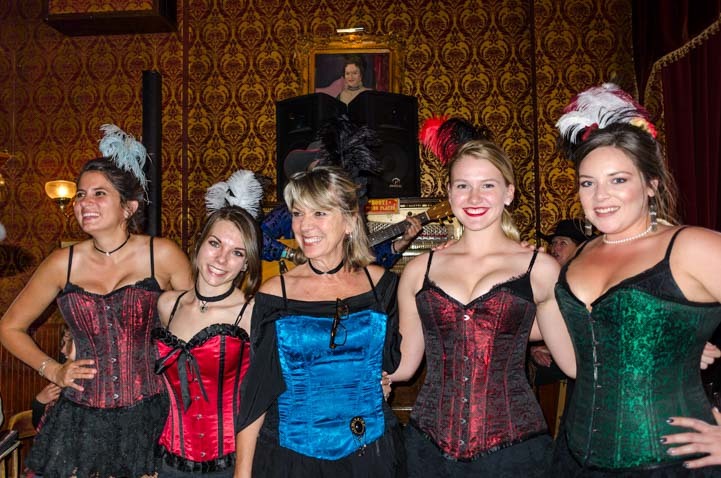 The Diamond Belle Saloon’s barmaids give us a smile! If you don’t know what Cowboy Poetry is, you are in for a special treat when you get to a Cowboy Poetry Gathering. Folks who love the western ranching lifestyle and people who are real live cowboys today get together and tell stories, sing songs and memorialize a way of life that is rapidly slipping away. Cowboy poet Don Cadden sings us a song. We are fortunate to be good friends with a popular cowboy poet, Don Cadden, a native Texan who heads up the enormous Cowboy Poetry Gathering in Alpine, Texas, in February each year. Don has recorded many of his songs on CDs, and they are hauntingly beautiful (links below). If you have ever felt nostalgia for a place that has changed with time, his song, “It Ain’t Texas Any More” will bring tears to your eyes (it does mine, and I’m not a Texan!). His poem “If Old Hats Could Talk” is a moving stroll through a row of old cowboy hats hanging on a wall that describes the personality of each hat and the story of the person that wore it. Cowboy Poetry is as much about music as it is about poetry! 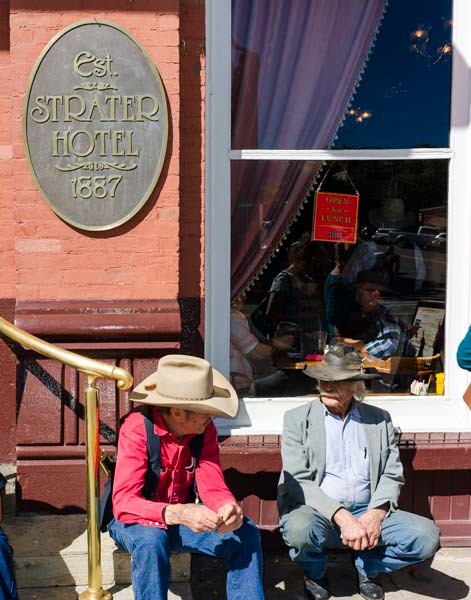 The Cowboy Poetry Gathering in Durango fills every possible venue in the Strater Hotel and around town, as formal performances take place and informal groupings of friends play for each other in whatever nook or cranny they can find. 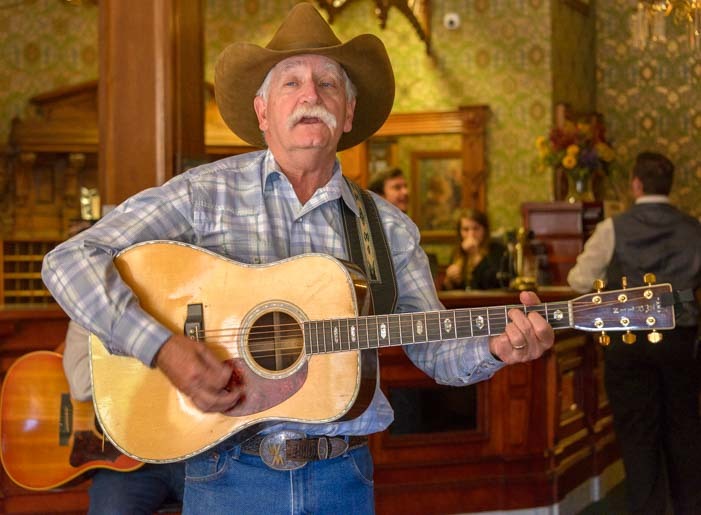 Don Cadden was scheduled to perform in the Diamond Belle Saloon, but the bar was so loud with reveling cowboys and cowgirls that he moved his group of perfomers to the hotel lobby where the audience could enjoy the music and be close to the performers. More than a few tourists coming into the hotel stopped to listen for a while before making their way to Reception or their rooms! Cowboy poets were performing all over the place in Durango even the hotel lobby! 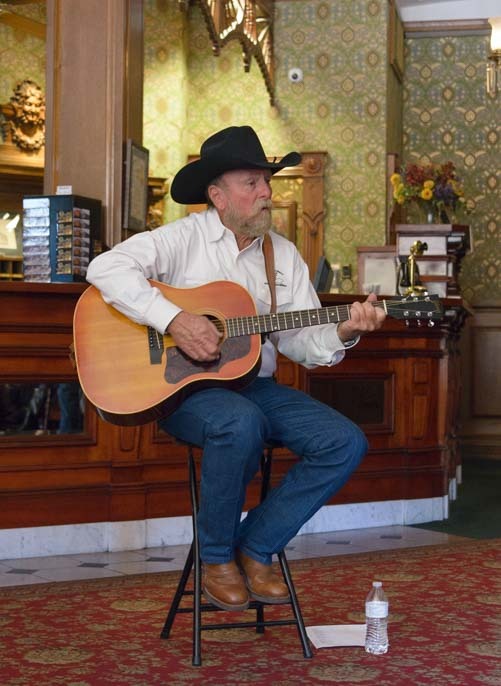 We watched a more formal performance on a stage in the Strater Hotel where a group of cowboy poets took turns telling hilarious stories, reciting funny poems and singing songs. 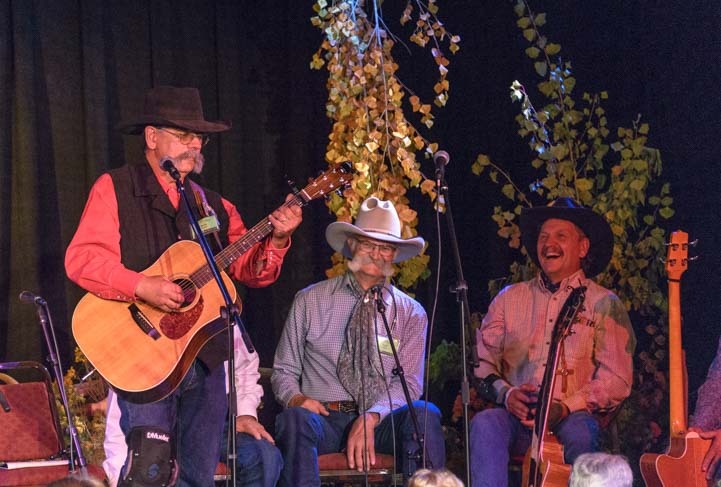 Cowboy poets on stage regaled the audience with hilarious stories and songs. 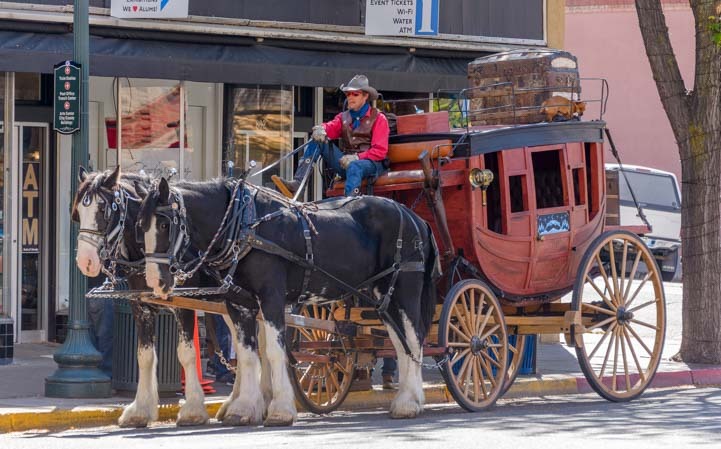 A common theme was the progression of modern day cowboy life — with its cell phones, Facebook and ATVs — away from the traditional ways of doing things around a ranch, in person and on a horse. Even the oldest of today’s cowboys is fully connected to the world electronically, as we all are, and of course none of them are quite old enough to remember a time when the only connection between people across long distances was word of mouth, hand-written letters, newspapers, or the slick, newfangled telegraph system. Nostalgia for earlier times without cell phones and Facebook were common themes in the poems and songs. 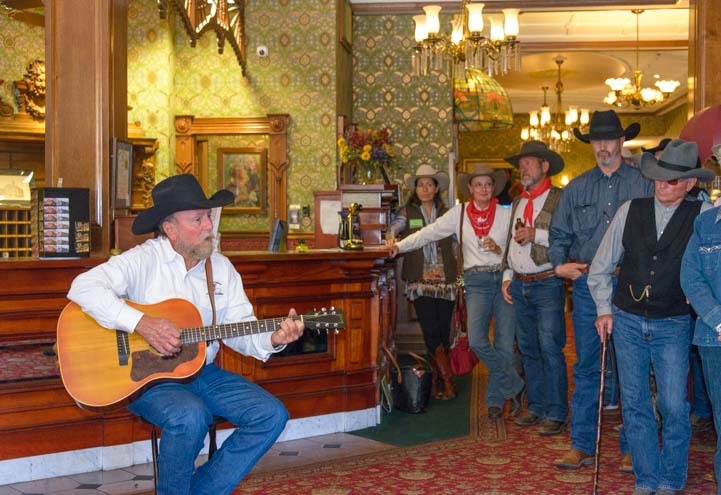 The really fun thing about the Cowboy Poetry Gathering is that there were cowboys all over the place, inside the hotel, outside the hotel, and strolling down the streets of Durango. Many of them talked with each other about their ranches and their horses as well as their music and poetry. Old cowboys chatted with each other when they weren’t performing. We had a chance to talk to a very old cowboy who has been part of the cowboy poetry community for many decades. 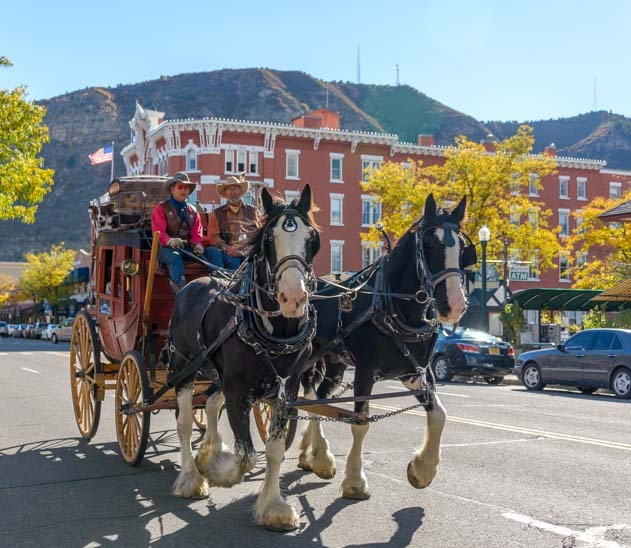 Of course, Durango is a pretty big city, and many of these ranchers had driven to town by truck. After all, Durango doesn’t really have any places to tie up a horse. But they do have cool bike racks! 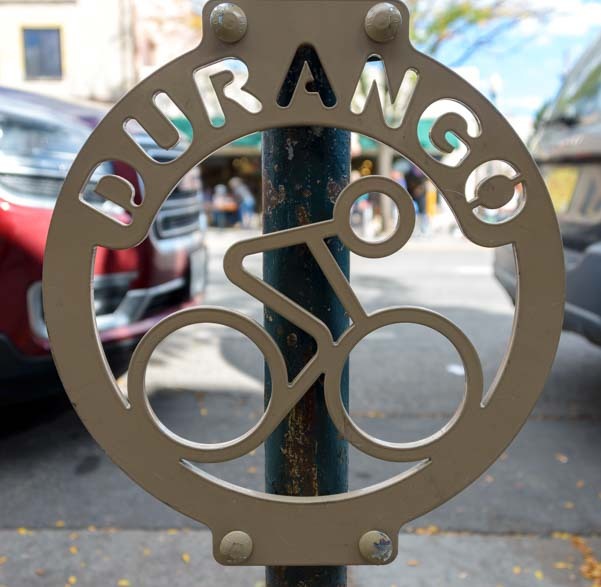 Durango is a hip town with decorative bike racks on the parking meters. We’ve been to Durango a few times over the years, and one of our favorite places to grab a microbrew beer is at the Steamboat Springs Brewing Company. We joined all the cowboys that had worked up a thirst from singing and went on in. Steamworks Brewing Company is an awesome place to wet your whistle! 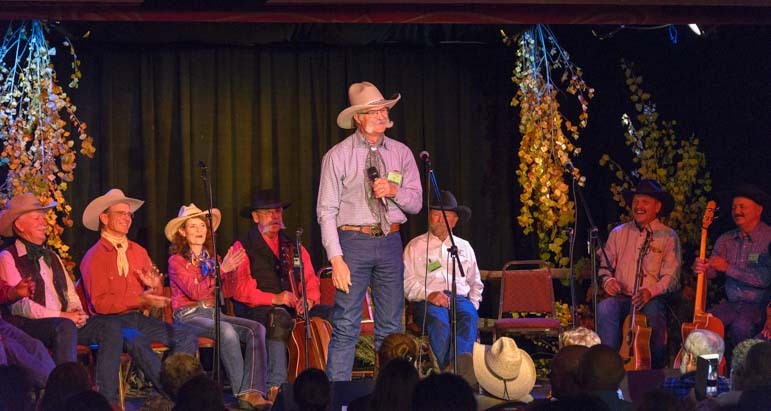 If you are planning a Fall RV adventure in southwestern Colorado or if your winter RVing plans will take you to southwestern Texas, going to one of these gatherings of cowboy poets is a real highlight. 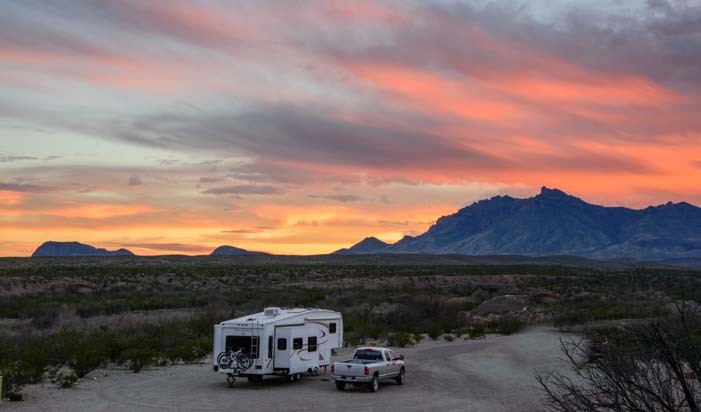 A wonderful spot for an RV trip in the winter is Big Bend National Park in Texas where you can find a cowboy poetry gathering in nearby Alpine, Texas, each February. 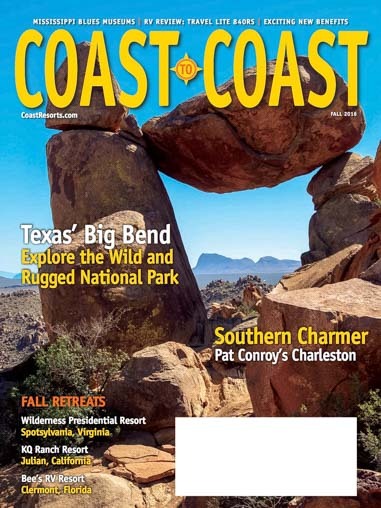 The Fall 2016 issue of Coast to Coast Magazine includes a feature article I wrote about our RV trip to Big Bend National Park and is decorated with photos from both of our cameras during our stay there. 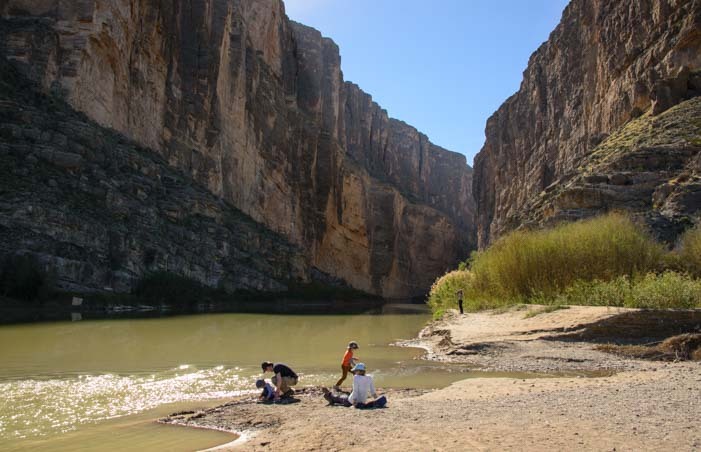 Big Bend National Park has mountains, deserts and a big ol’ river (the Rio Grande), which makes for an incredible variety of options for hiking, cycling, photography and sightseeing. There is also a ghost town and a very funky hippie town in Terlingua on the far western edge of the park. 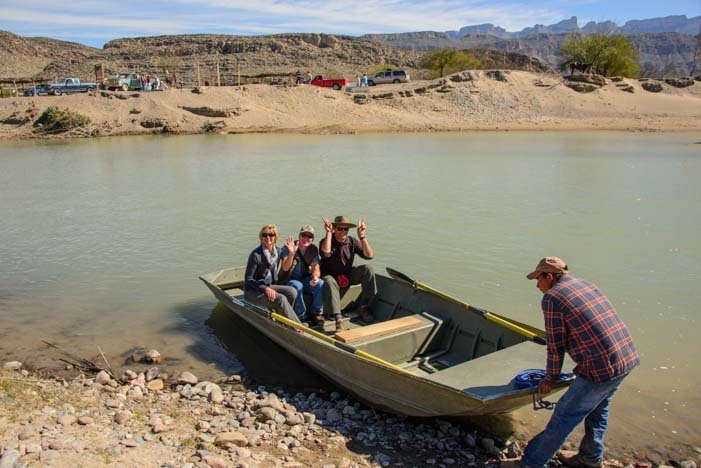 And passport holders can slip across the border to Mexico in a rowboat and enjoy a daytrip to the classic Mexican town of Boquillas del Carmen, a place that we found offered as authentic a Mexican experience as any we had had in our nearly four years of living in Mexico on our sailboat. Taking the ferry across the Rio Grande for a daytrip to Mexico. 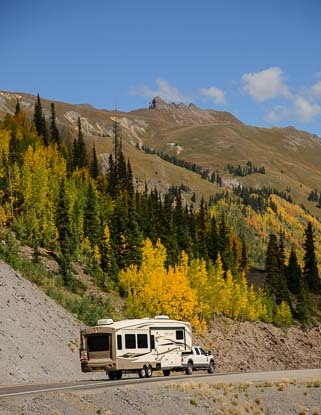 Love boondocking? Visit our page: Tips for boondocking at Big Bend! 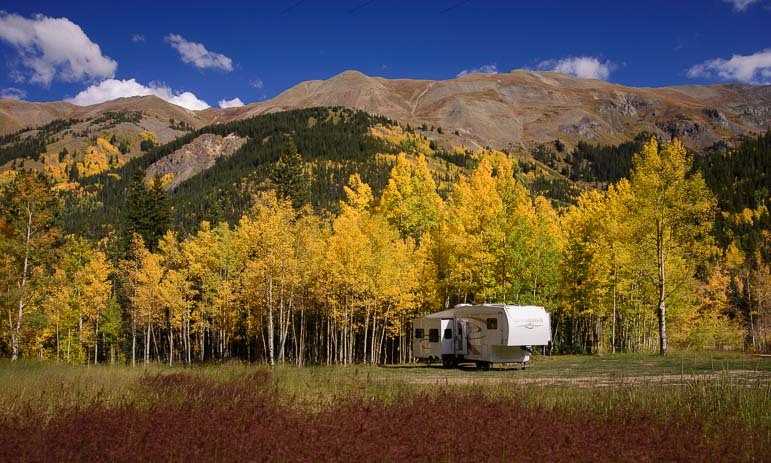 Colorado’s San Juan Skyway – An RV Trip in Dazzling Fall Color! 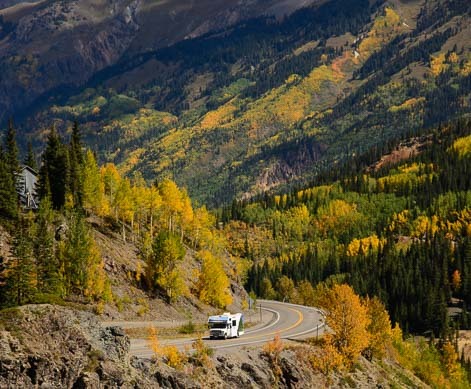 September 2016 – During the last ten days of September each year, the San Juan Skyway in the Colorado Rocky Mountains becomes one of the most dazzling places we have ever visited with our RV. 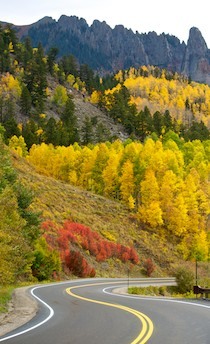 Astonishing color on an autumn RV trip along Colorado’s San Juan Skyway. WOW!! 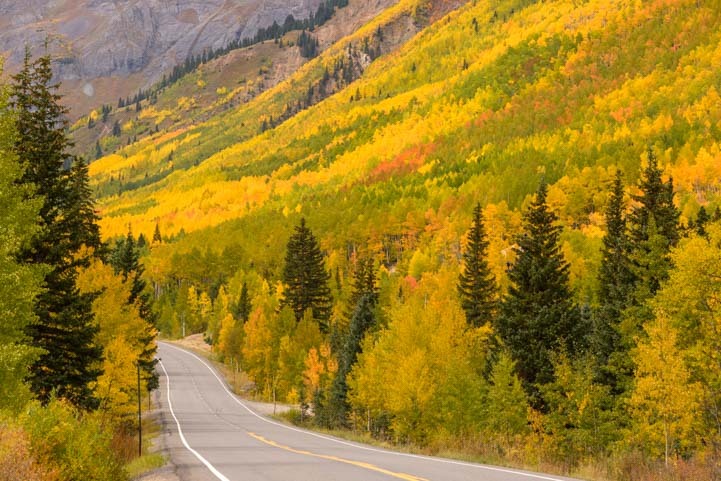 Beginning around September 20th and continuing through the first few days of October, this 235 mile long drive comes alive in utterly spectacular color. 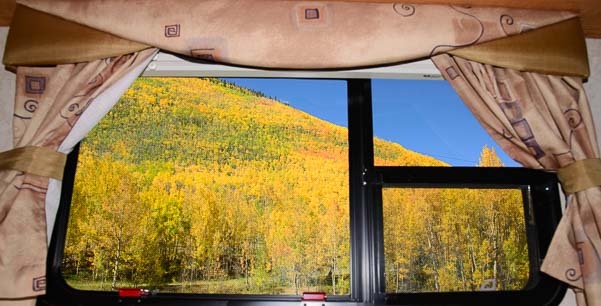 Towering mountains on either side of the road are covered in swatches of vivid color as the aspens don their golden cloaks. Patches of yellow spring up in every direction, and as the days go by, green becomes yellow and yellow turns to vivid orange. 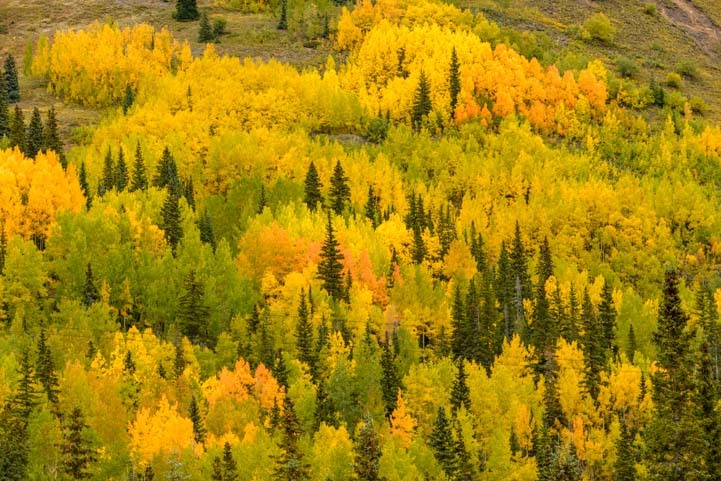 The trees join together and form patterns in the Rocky Mountains, and visitors carrying cameras of all shapes and sizes gape in awe at the splendor of Nature’s majesty. 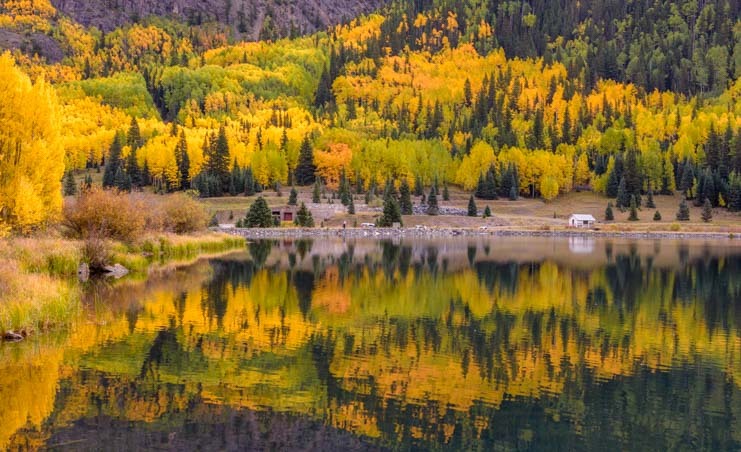 In places, lakes reflect the glory of the mountains on their glassy surfaces, mirroring the stunning fall colors in their depths. 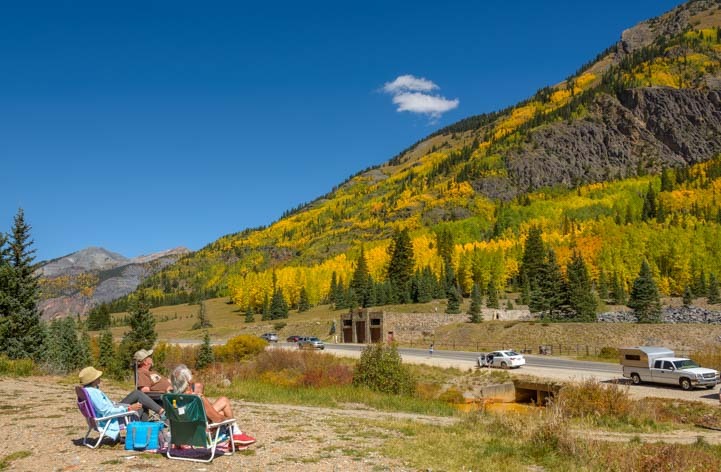 Along with dozens of other grinning, camera wielding tourists, we stopped along Colorado’s jaw dropping Million Dollar Highway to take in the views and take some photos. 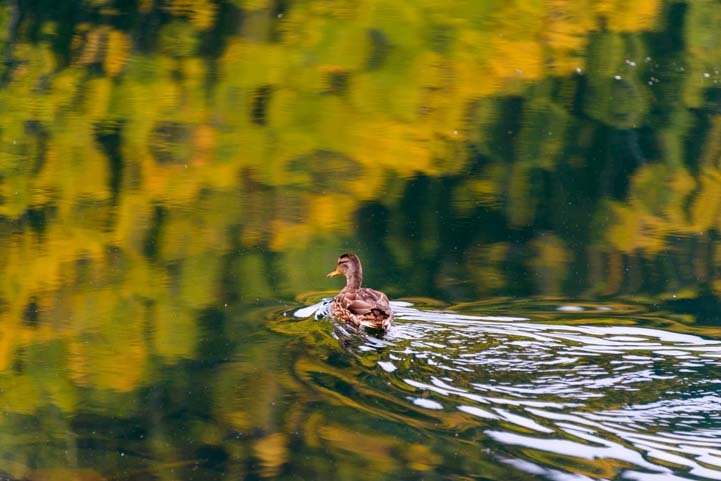 It was early morning on a grey day, and we watched a duck swimming across a small lake. Vivid colors brighten a grey morning at Crystal Lake. 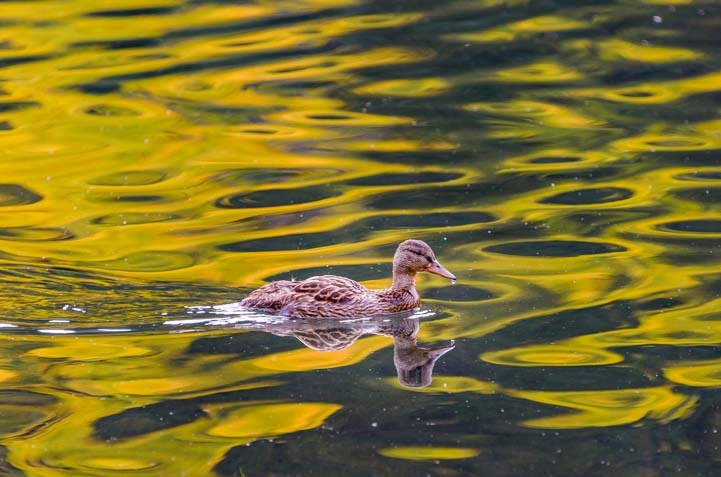 As she headed towards the shore, she swam into the reflected colors. 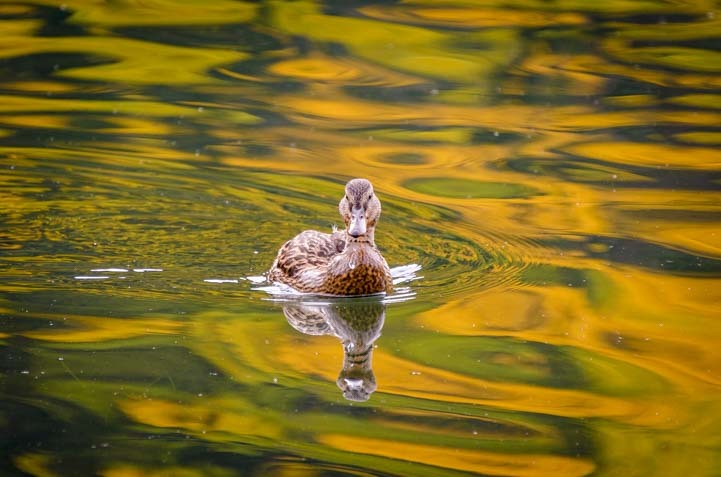 The undulating surface surrounded her in golden ripples as she quietly floated across this magnificent backdrop. She stabbed the silky water with her beak, seeking out yummy morsels, and tiny water droplets fell from her beak as she turned. 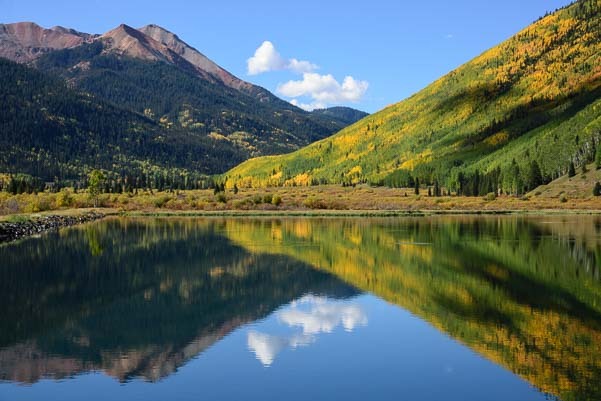 The lake mirrored the vivid, patchwork hillsides in the water, creating a breathtaking image. 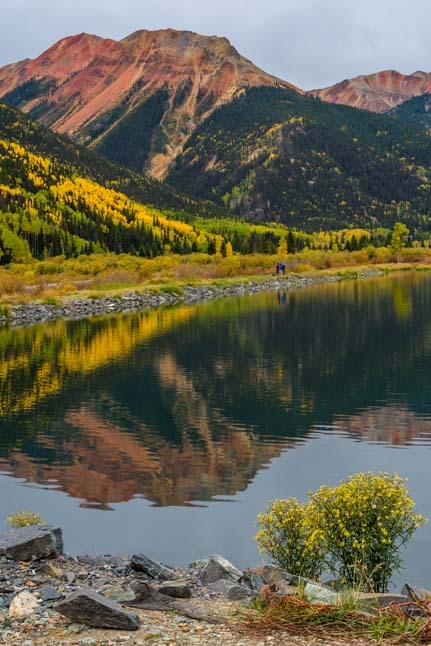 On the side of the lake, tourists set up camp chairs to admire the mountain views. And what a view they had. 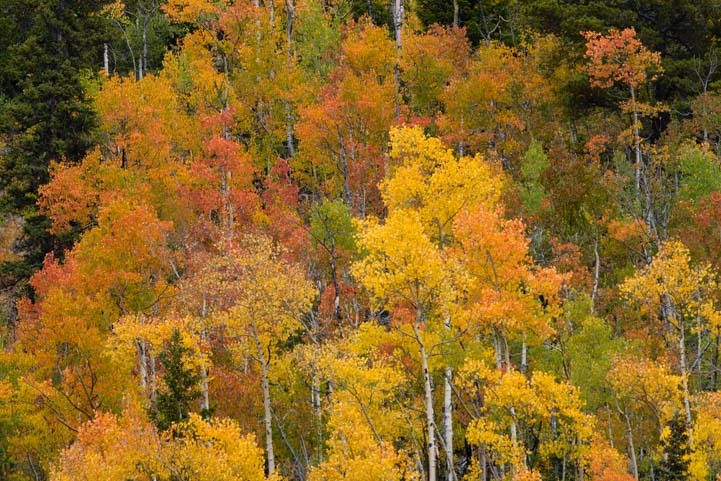 Both from a distance and from up close, the colors of the trees were awe-inspiring. 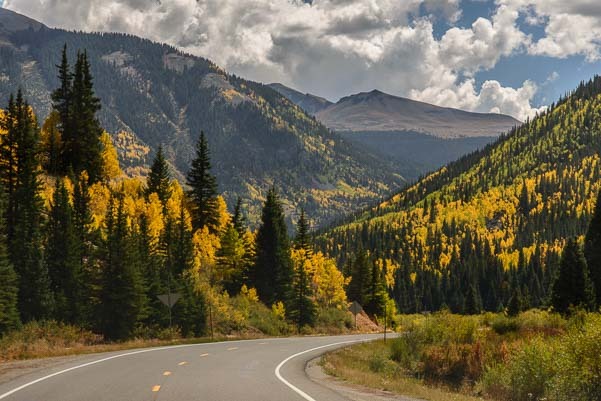 Like Utah’s Scenic Byway 12, the San Juan Skyway is an All American Road. 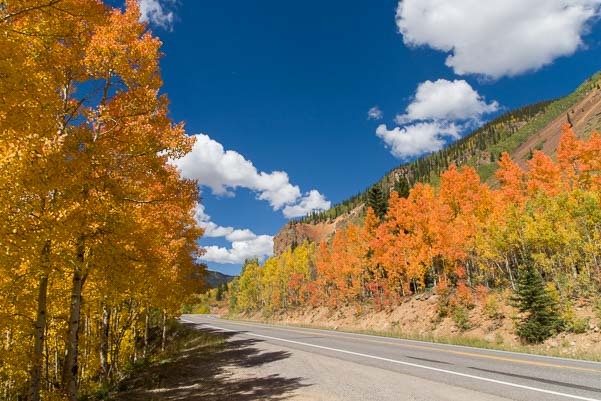 It is a loop drive that passes through some of Colorado’s most charming mountain towns. Rico is one of many cute towns along the San Juan Skyway. 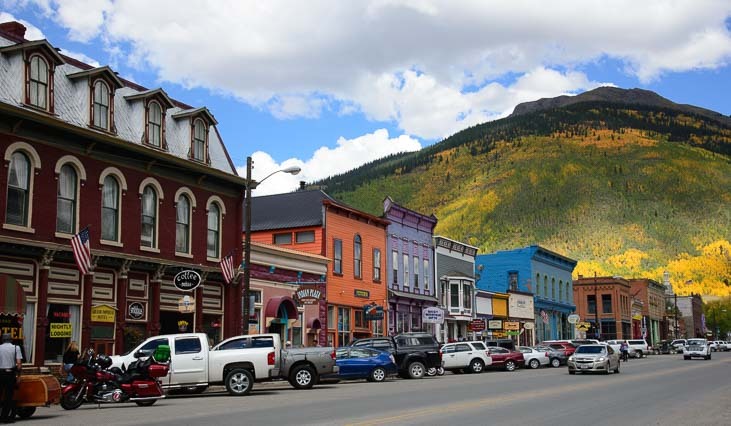 Beginning in Dolores, Colorado, the San Juan Skyway follows SR-145 northeast through the village Rico to the trendy town of Telluride. 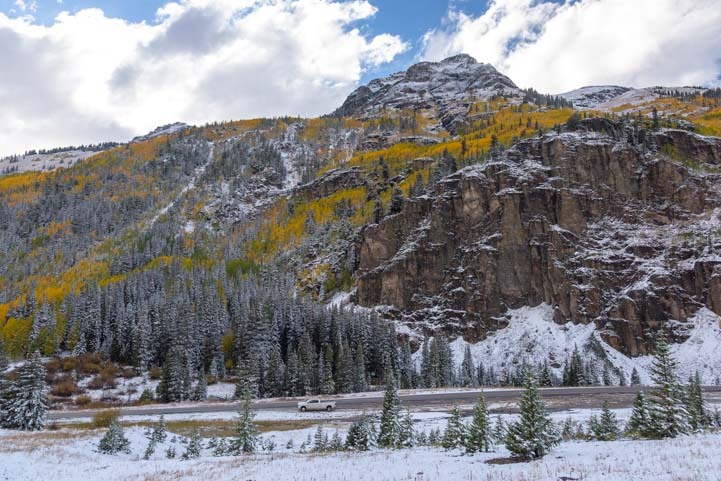 From Telluride, the San Juan Skyway continues northwest on SR-145 to the town of Placerville where it heads northeast again on SR-62 to the town of Ridgway. 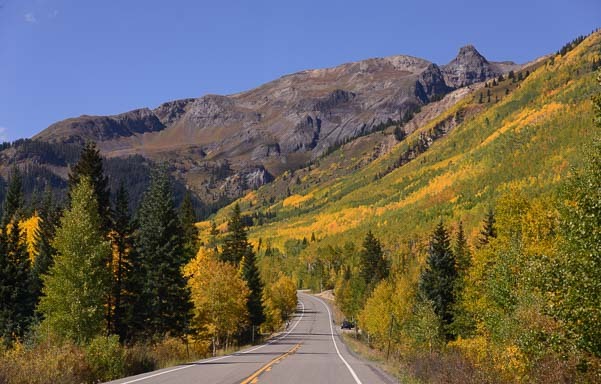 From Ridgway, the autumn colors intensify as the San Juan Skyway turns south on US-550, also known as the Million Dollar Highway, and travels through Ouray and Silverton to Durango. A fish-eye lens and a starburst – what fun! 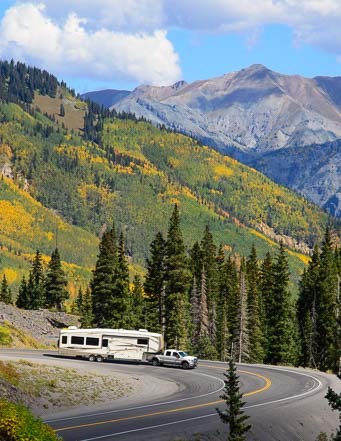 This portion of the San Juan Skyway takes RVers on tight hairpin turns and 10% grades to climb over three mammoth mountain passes that range between 10,000 and 11,000 feet. Stunning reflections and post-processing fun. 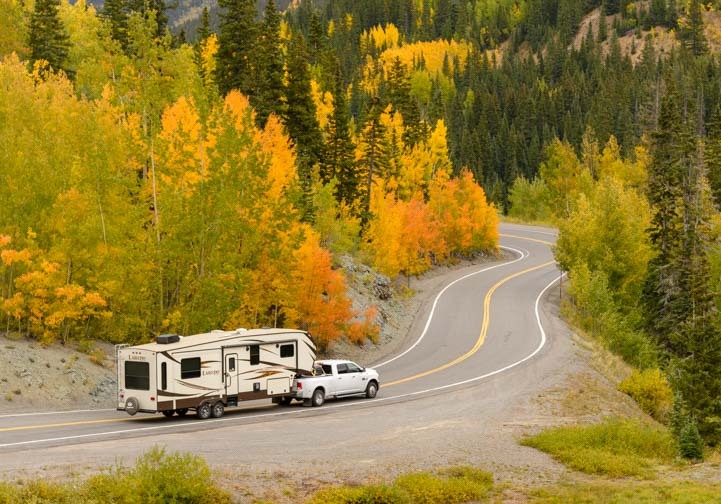 This is an extraordinary road that is easily traveled in an RV that has a strong engine or is towed by a strong truck (semi-tractor trailers traverse the Million Dollar Highway 24/7 in large numbers). 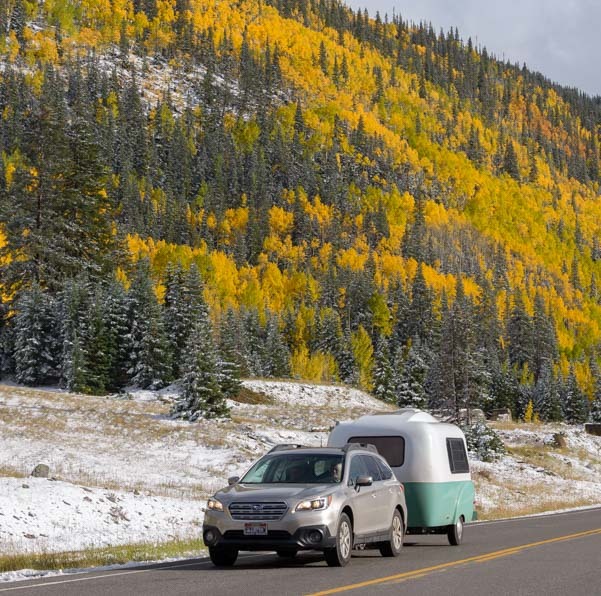 For first-timers, is worthwhile to drive the road in the toad or tow vehicle at least, just so you know what is in store. 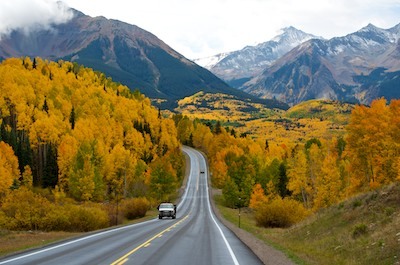 And who wouldn’t want to do this drive multiple times during those magical autumn days?! Heading up the Million Dollar Highway. We have been fortunate to sample various portions of the San Juan Skyway on three separate occasions since we started RVing full-time. Each time we have been wide-eyed with wonder at the sensational scenery all around us. San Juan Skyway – An INCREDIBLE drive!! 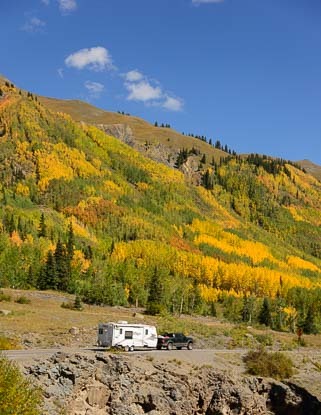 For RVers planning an RV trip on the San Juan Skyway, there are various informative links below. 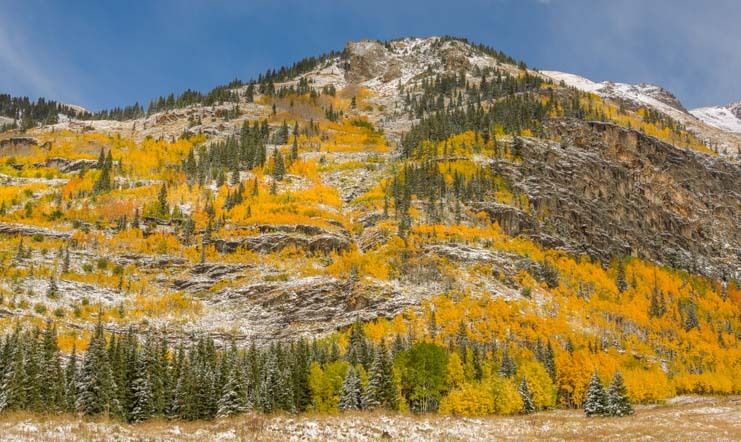 San Juan Mountains Colorado – And then it Snowed! 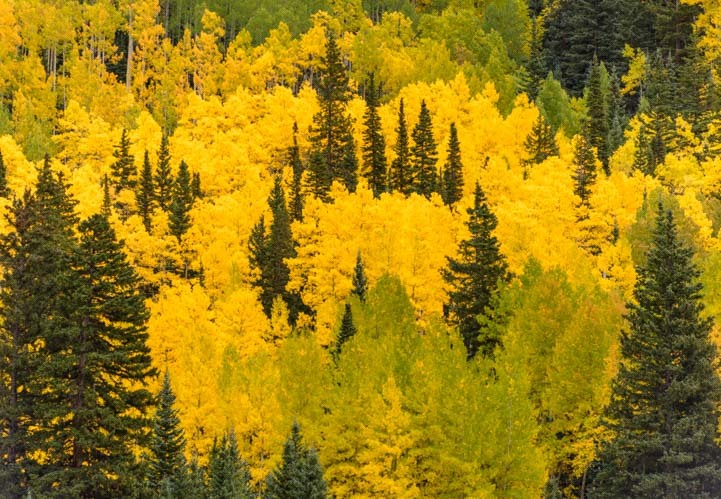 October, 2014 – When we first arrived in the Ridgway/Ouray area in Colorado, the aspen trees were just beginning their autumn golden glow. 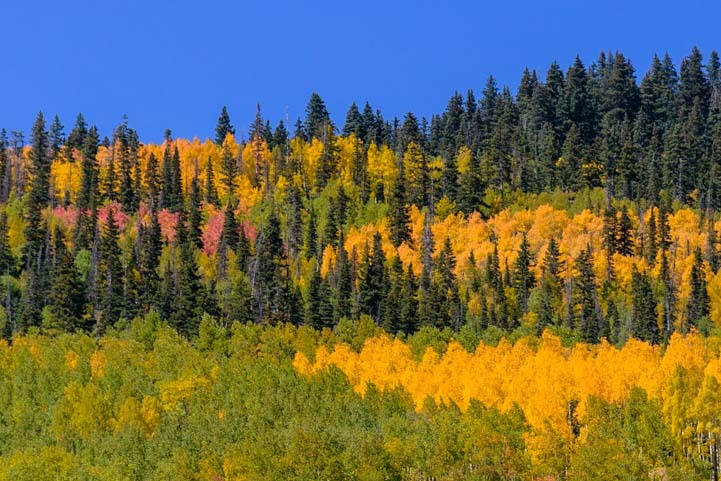 As the days passed, their colors intensified until we were surrounded by a vibrant mass of yellow set against a rich blue sky. 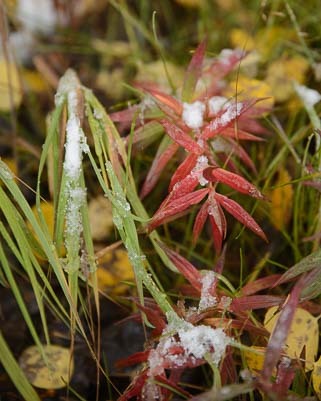 Autumn is the harbinger of winter, though, and before long we found ourselves in the middle of a snowstorm. 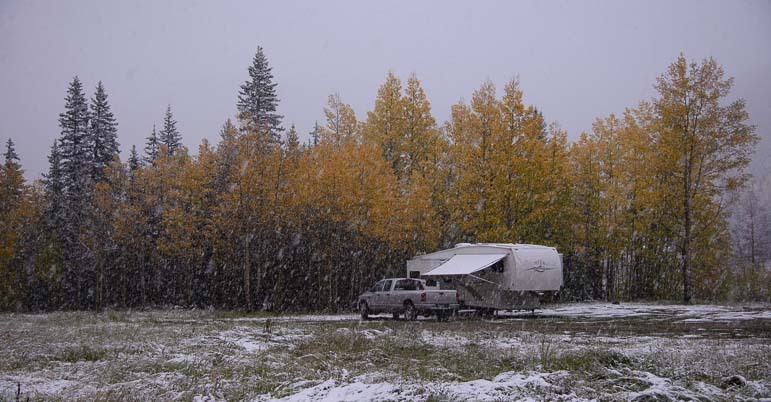 We have never been in a snowstorm in our RV, and it was quite exciting — and very surprising, as it was still early October. 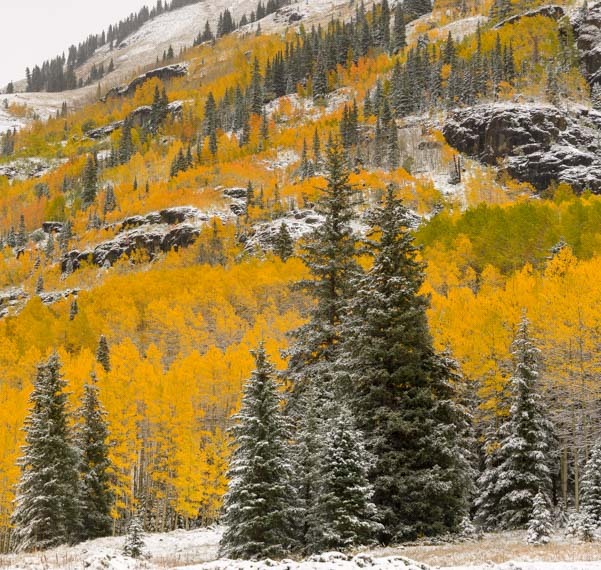 The “Million Dollar Highway” becomes a winter wonderland. The snow fell steadily around us, and slowly a gossamer veil of white settled on our world. There was enough of the white stuff to stick around awhile, and when we finally emerged out of the fifth wheel, the amber woods had become a winter wonderland trimmed in white lace. 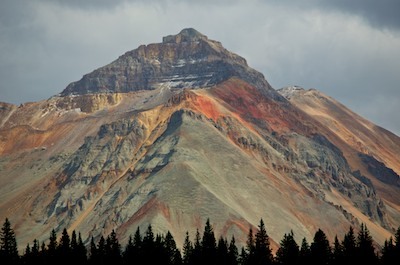 We tip-toed around in total awe of the scene and took our cameras out for a drive along the Million Dollar Highway. If it’s possible, the landscapes were even more beautiful now than before. 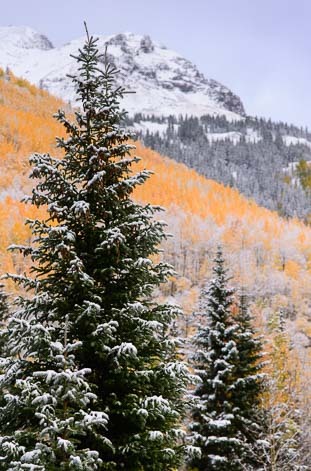 The snow on the orange aspen trees looked like peaches and cream, and the stately evergreens added dramatic accents here and there. We were here because our friend Nasim Mansurov was conducting a photography workshop. 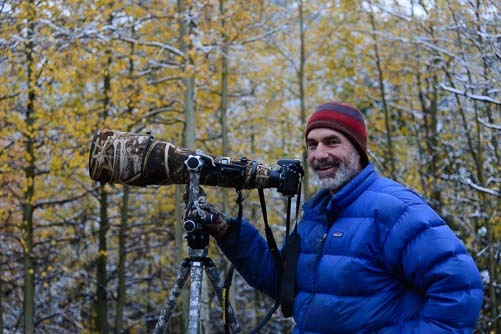 One of the highlights was meeting John Sherman, a professional bird and wildlife photographer who was an instructor at the workshop. He lives in a custom built Class C motorhome full-time, and as we tromped around in the snow the first morning after the snow storm, he suddenly appeared between the trees. 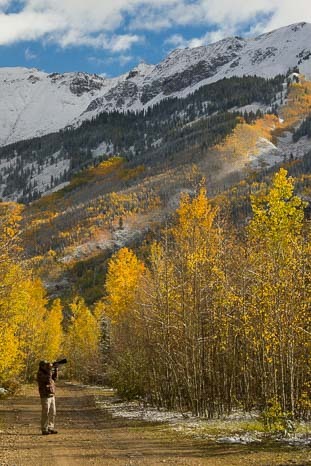 He was shooting birds that morning, of course, rather than snowy landscapes, and he was using a staggeringly long 800 mm telephoto lens (yes, gasp, that price is correct, lol! Merry Christmas, anyone?!). The darn thing is so big that the lens mounts directly onto the tripod (usually the body of the camera is what sits on top of a tripod). I just had to get a photo of him with this thing! See the tiny camera body on the end of it? John “Verm” Sherman and his LENS! He ended up getting some wonderful photos of tiny birds high in the trees that we didn’t even know were there! In the following days we got to know John a little bit. We were almost in a daze as we walked around taking photos. He has shot two back covers for Arizona Highways magazine as well as some full page and two-page photos on the inside. How cool is that?! 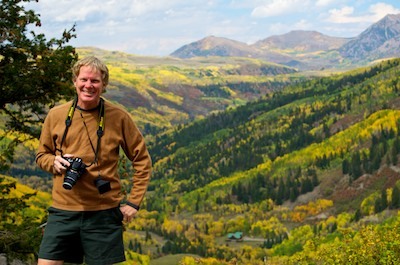 He also writes for PhotographyLife.com and his posts are written with a wry sense of humor that always makes us chuckle. The spectacular colors seemed even more-so after the snow. His girlfriend Dawn Kish also shoots for Arizona Highways and has had more front cover photos on that beautiful magazine in the last five years than any other photographer. Good Lord!! We were keeping some pretty illustrious company — way out of our league! — but we were learning lots and having a blast at the same time. One evening John and Nasim did a critique of students’ photos, and it was a fascinating exchange between the two of them and each student as they went over the highlights and flaws in each photo. 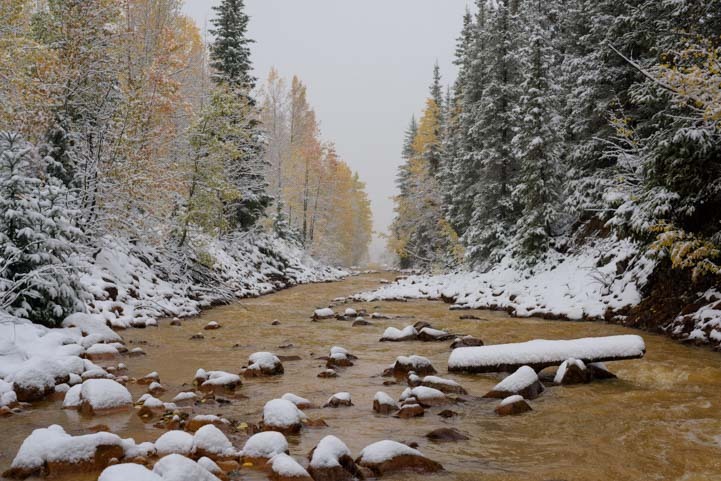 This was cold camping, but oh so pretty! Everyone in the room was able to see how a slight adjustment here or there would have transformed a good photo into a great one. Many photos, of course, were fabulous already and just got big nods of approval all around. Out here in this newly snowy world, we were loving hanging around with a full-time RVer who shares our fascination with photography. This deer visited our trailer many times. John is a rock climber as well, and was Senior editor of Climbing Magazine for years. He’s also written several popular books about climbing and bouldering. Here’s a link to some of his very impressive work. Wow!! 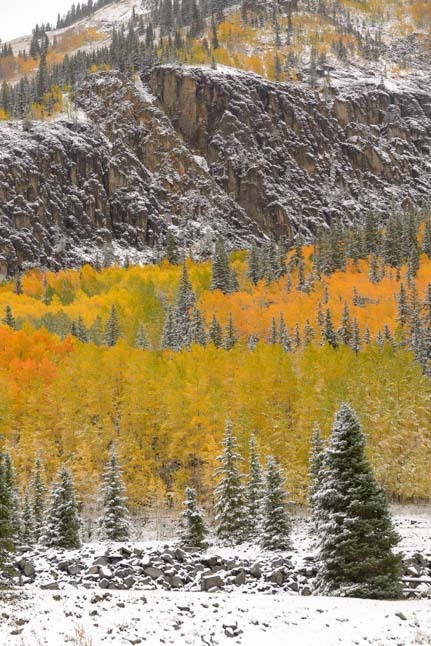 This was a cold world up here at nearly 10,000 feet in the Rocky Mountains, but the wildlife was plentiful. One night we listened to elk bugling all around us as we laid in bed. We didn’t see any during the day, but their high pitched calls filled the night air. We did spot a little deer who hung around our trailer in the mornings and evenings for few days. We both marveled that he could manage all winter in this freezing climate. 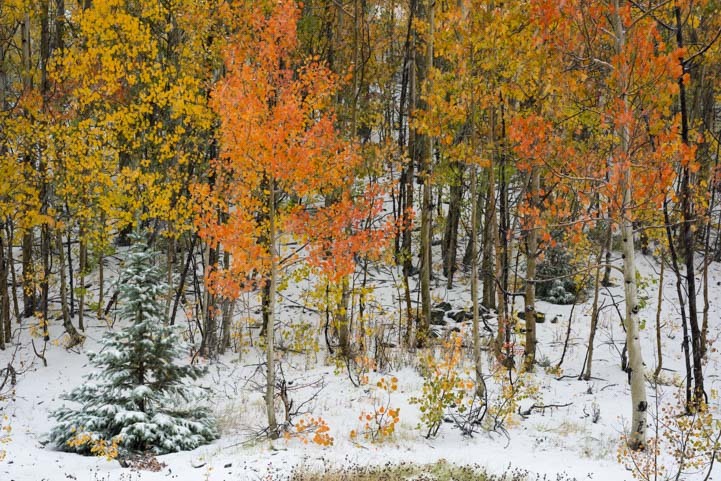 The bushes and trees hung onto their colorful leaves in the first snow. He didn’t have an ounce of fat on him, and the fur coats that deer wear are not very thick! 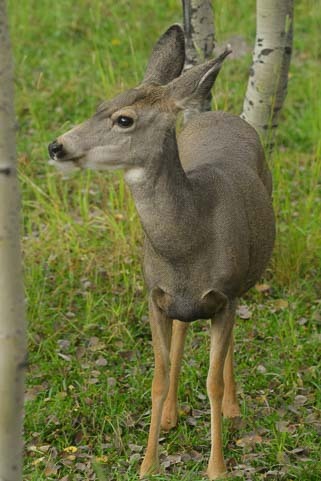 Before the snowfall, he had come by our trailer one evening, munching the grass between the aspen. It was way too dark to get a photo of him, so we watched him quietly from our spot by our window. After getting his fill of grass, suddenly he lowered himself to the ground and folded his legs under his body. His ears twitched as he listened to all the night sounds growing around us. Every movement we made in the rig made his ears turn our way. The night got darker and darker and he stayed put in his little spot. 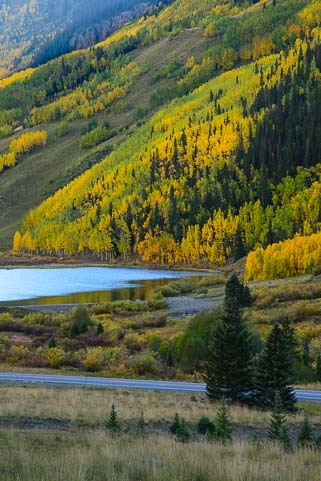 If you have a chance to go to Colorado in autumn, do it!! An amber window on a snowy world. Before long his head began to droop lower and lower, and in no time he had fallen asleep, right next to our fifth wheel trailer! We were absolutely delighted. We had a special neighbor — and a trusting one. When we got up in the morning he was gone, but the long grasses were all flattened out where he had made his bed for the night. This was a magical time in every way. 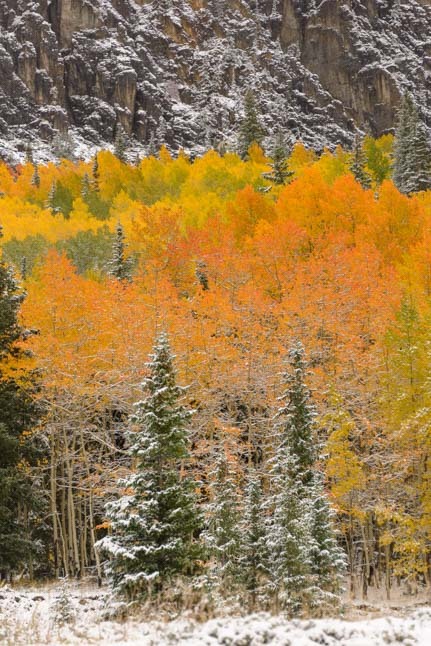 The colors on the trees were still vibrant, and the snow was a brilliant white in the sun. Treading down a golden path. 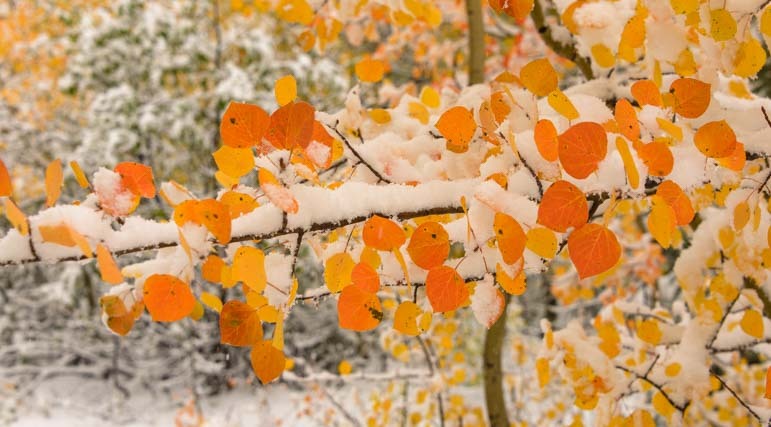 For a few days the trees and bushes hung onto their leaves tightly, cradling the snow that had fallen. The photography workshop came to an end and everyone disbanded, but we couldn’t tear ourselves away from the beautiful San Juan Mountains. We wandered down dirt paths and drove up and down the highways, catching each view in different lighting as the days passed. 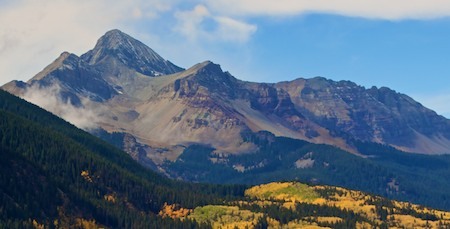 Looking up towards Red Mountain Pass. 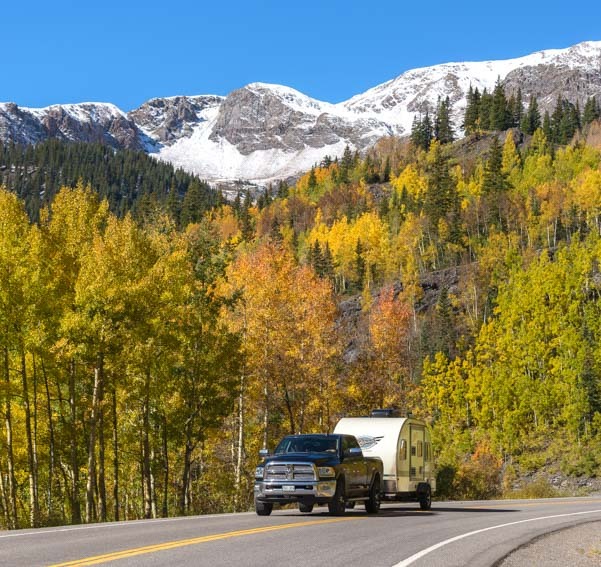 When we drove through the town of Ouray, we noticed that almost all the RV parks that had been full to overflowing two weeks earlier were now virtually empty. The red “No Vacancy” signs on the hotels had changed to “Vacancy,” and the outdoor bar on the second floor of the Ouray Brewery that had been packed every afternoon since we’d first arrived was now empty. It seemed like we were the last visitors in town! And no wonder — it was freezing cold. In fact, when the snow fell the first night and into the next day, we were so focused on trying to stay warm that we didn’t really think about the other systems in our rig. Mark does some starburst magic in the late afternoon sun. Huh? Oh, right, they were covered in snow!! Oops!! He scampered up on the roof and found there was well over an inch of snow on top of them. 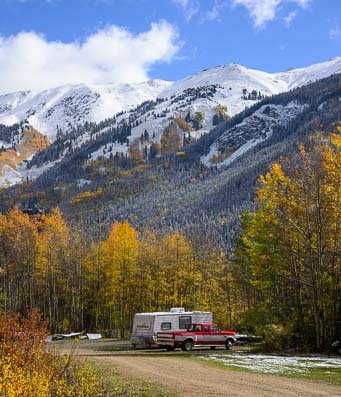 We had been running our electricity-hungry RV furnace almost non-stop all day, because the 10,000′ elevation was so high that our vent-free heater would run for only an hour or so before the oxygen detection sensor shut it off due to lack of oxygen. Unfortunately, the furnace could barely keep up, and we were in shade until late morning. So, the batteries needed a little boost! For the second time this season, Mark fired up the Yamaha 2400i generator to save the day and charge the batteries. 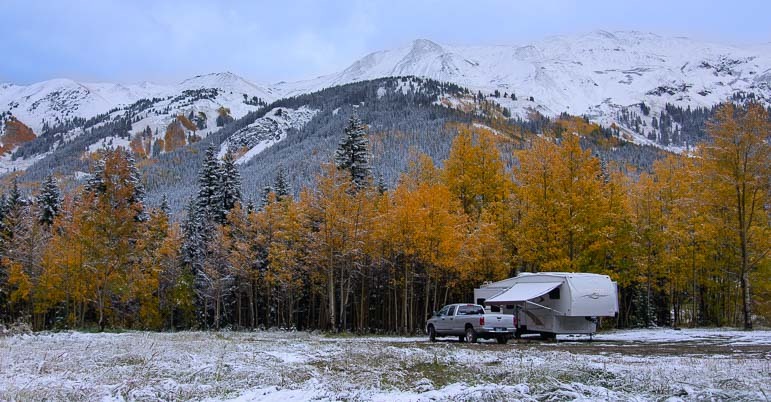 After the snow, the RVs left for warmer places! The truly amazing thing about this underused generator is that, despite the cold, it started on the first pull, and it ran beautifully for the bulk of two days while we lived through this mini Arctic blast. We don’t use that thing very often, and we sometimes regret the space it takes up in our rig as we chauffeur it around, but it sure comes in handy at times! 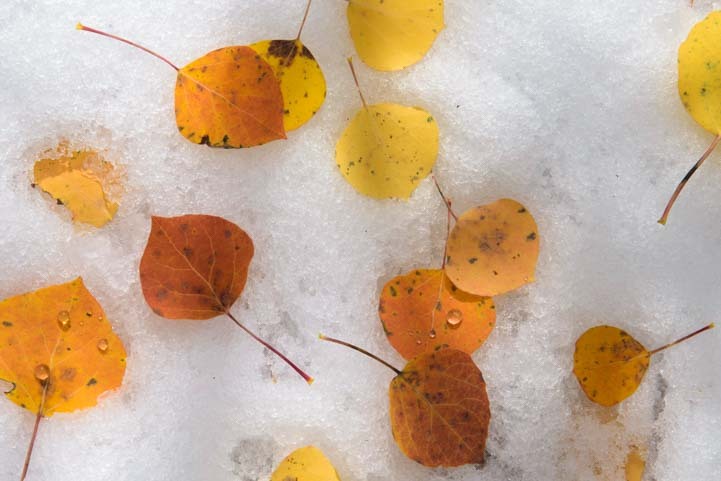 After the second snowfall, we sadly watched the colorful leaves fade to their winter shades. They began to fall from the trees like rain every time the wind blew. It was time to go! We packed up the buggy and headed up and over the Million Dollar Highway one last time — with 14,100 lbs of house in tow! 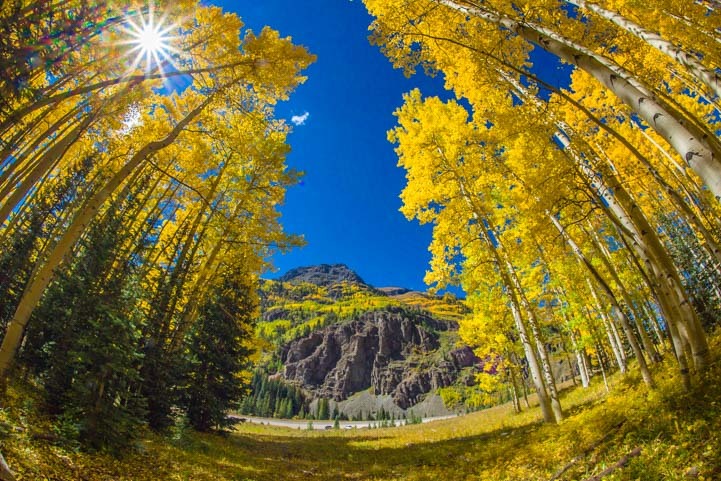 October, 2014 – We were loving our stay amid the golden aspen of Ouray, Colorado, where every view we saw in every direction we turned was a true jaw-dropper. Our cameras were going non-stop. 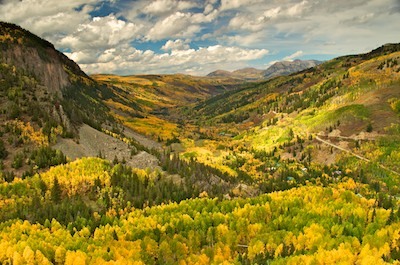 Ouray sits in a valley surrounded by mountains with a narrow ribbon of highway running through it. 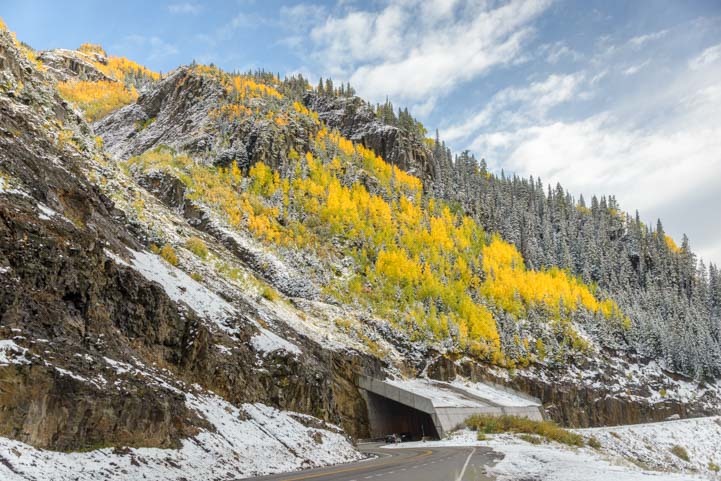 This highway, US Route 550, is a part of the San Juan Skyway, a breathtaking scenic loop drive that takes in some of the best mountain views that Colorado has to offer. 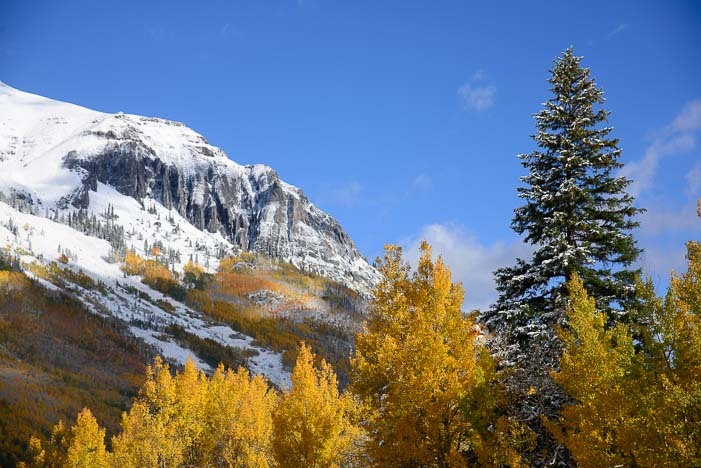 Swinging through Telluride, Ridgway, Silverton and Durango, the San Juan Skyway winds all through the mountains, soaring over the peaks and dropping down into the valleys. 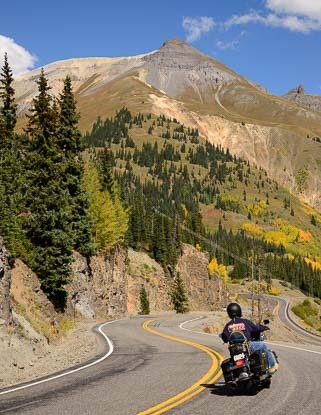 This is great motorcycle country! 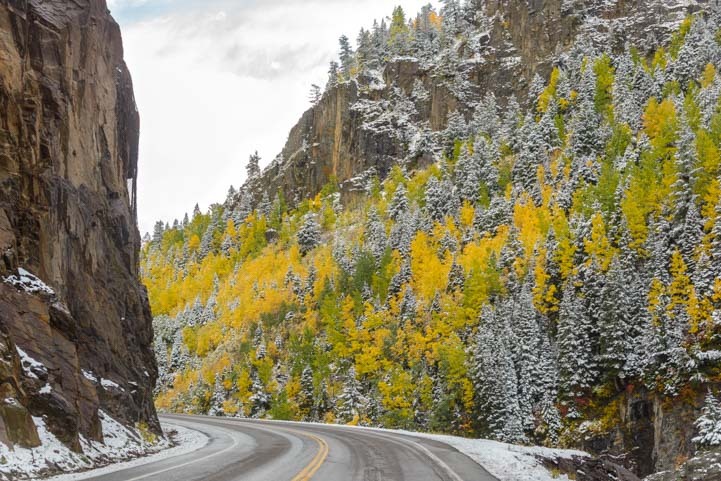 When it gets to Ouray, drivers headed south are at the starting point of one of the most spectacular 25 miles stretches of road in America. Nicknamed the Million Dollar Highway, the views are worth every penny (lol)! 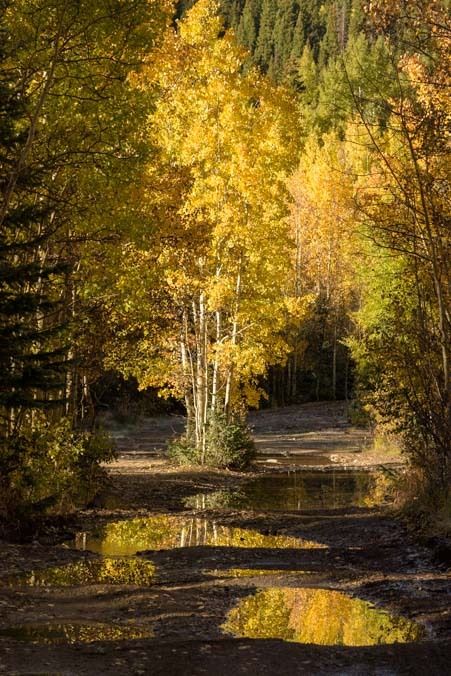 The origin of this name is uncertain, but it may have come about because it was thought that a million dollars’ worth of gold dust was in the gravel and dirt that was used to build the road in the late 1800’s. Or, the name may have come from the cost of paving the highway in the 1930’s. 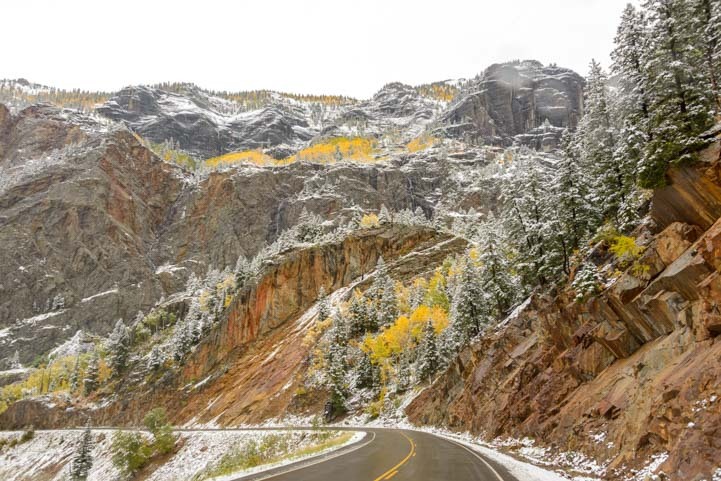 The views along this road are beyond stunning, but you’ve gotta steel your nerves when you drive it, especially if you are in the passenger seat heading south from Ouray to Silverton. Nevermind the beauty. This road is one of the most hair raising and dangerous highways in America. 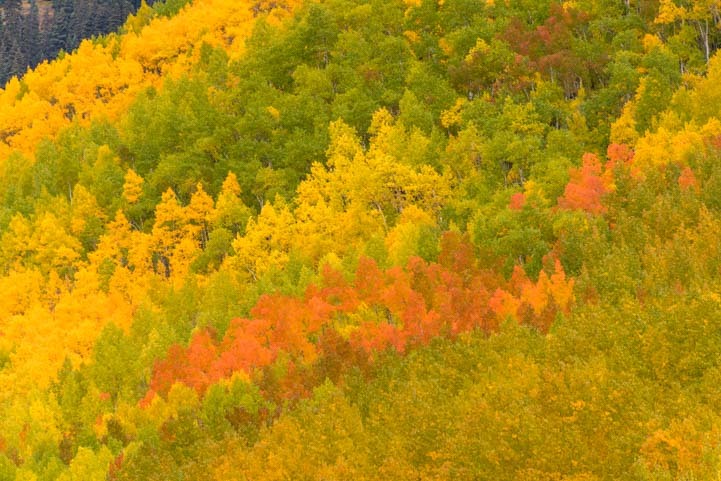 As we approached Silverton the aspens were ablaze! As we drove it the first time, we both kept saying “WOW” the whole way. Half of those “wows” were because the scenery was so incredible. But half of them were because of the utterly sheer and totally unprotected drop-offs that fell away from the truck’s right tires, falling hundreds of feet straight down to a chasm below my door! We stopped a few times at various pullouts and peered over the edge. OMG. At one spot we saw an upside down car way at the bottom of the gorge below us! Some consider this road among the most dangerous of America’s highways. Yikes! Lord knows if it was from a fatal crash or if kids had rolled a car off the highway to watch it fall. Over the decades I’m sure both of those things have happened! 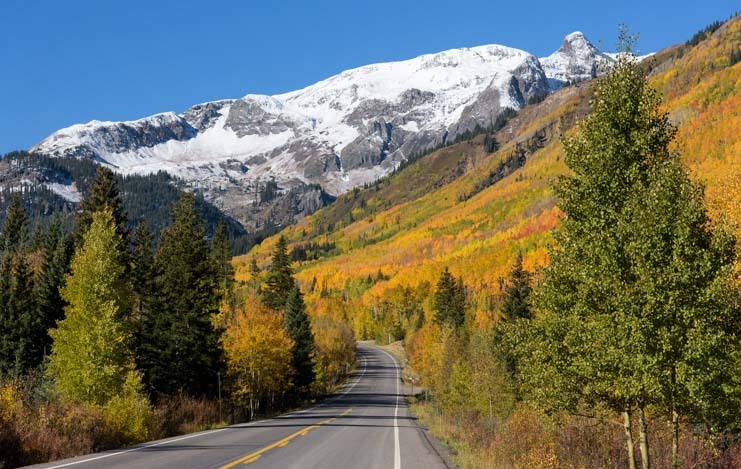 Yet, frightening as this drive can be for first-timers, semi-tractor trailers traverse it all the time, climbing up and over the three mountain passes that lie between Ouray and Durango, Colorado. I’m not sure that we ever saw any trucks hauling super heavy loads, but Freightliners and their like made up a significant percentage of the traffic on this narrow twisty road. It’s certainly intimidating when the weather gets ugly!! This gave us heart, because we were planning, at the end of our stay, to take our fifth wheel over this road. 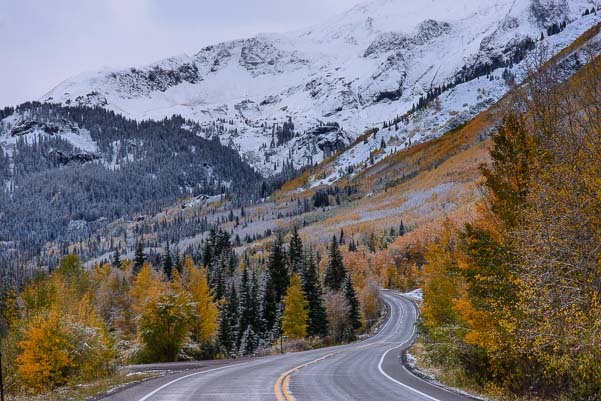 We ended up driving the Million Dollar Highway and its highest summit, Red Mountain Pass (at 11,000+ feet), many times during our two week stay, because the peak of the fall foliage color was happening all up and down its wild walls. So we got to know the many twists and turns and scary parts of the road. 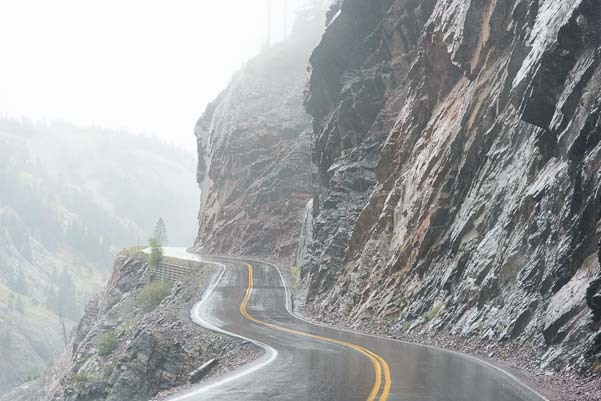 When the weather turned nasty for a few days, and the road got soaking wet, the clouds dropped into the canyon and filled it with fog, and the rain fell in blinding torrents on our truck. At least we knew what lay ahead! 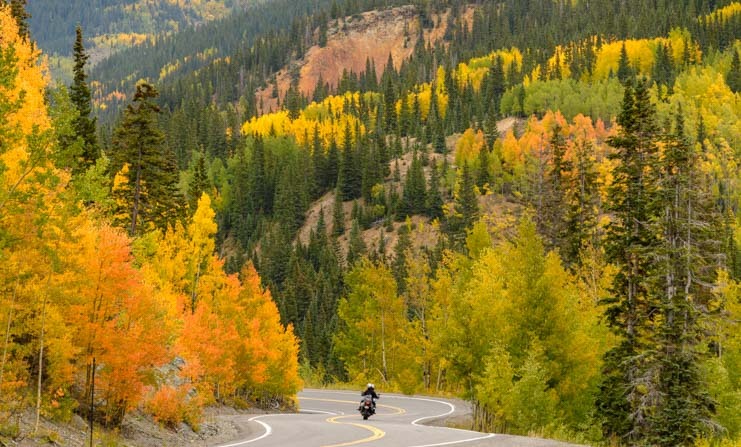 On a sunny fall day, this is motorcycle heaven! But on beautiful sunny days this is a drive people come from miles around to enjoy. We watched lines of touring motorcycles, groups of shiny new Ferraris, and even a caravan of rental RVs out for a scenic drive on this thrilling road. 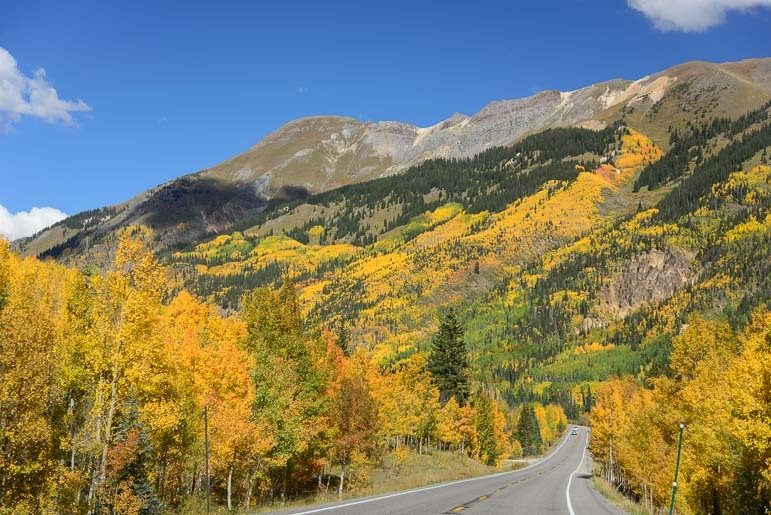 After crossing over the summit of Red Mountain Pass, the road begins to descend towards Silverton, and the fall colors jumped out at us from all sides. Then the valley opened up, and Silverton lay before us, a tiny town with a big mining history. 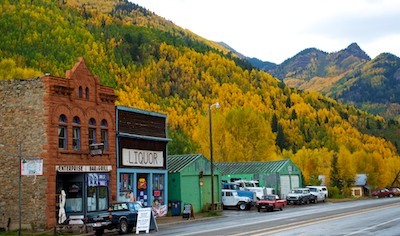 Silverton is one super cute Colorado mountain town. 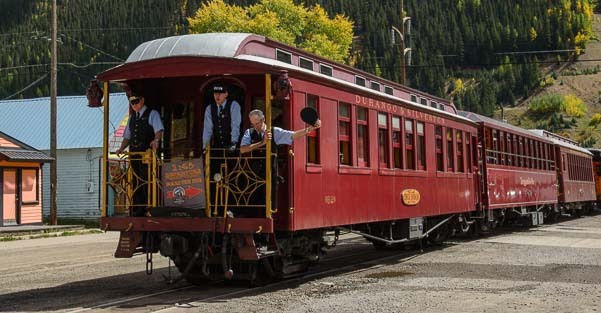 The Durango and Silverton Narrow Gauge Railroad is a fun stream train ride. 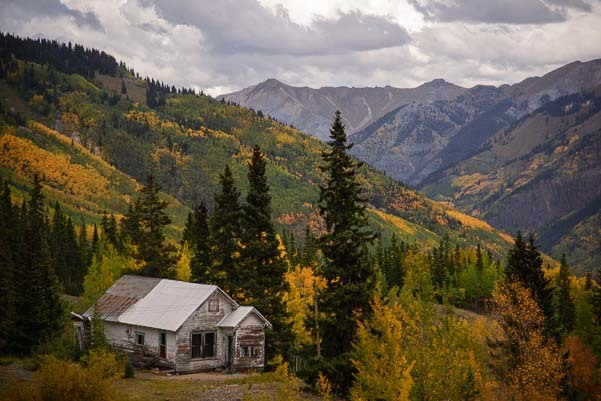 Once home to 1,100 people (in the late 1880’s) when the nearby silver and gold mines were flourishing, Silverton houses just 500 or so hardy souls today. Tourists love it, and it is a great spot to spend an afternoon or a few days. The Durango and Silverton Narrow Gauge Railway is one of the biggest attractions, and we saw it in the distance, chugging up into the valley under a thick cloud of black smoke that trailed off behind it. 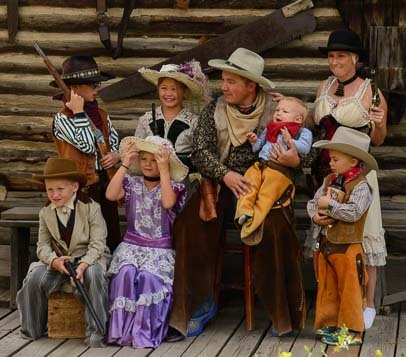 Not only is the town photogenic, but it’s a great place for western-themed portraits. This railroad was built in 1882, and it carried both mining supplies and tourists right from the get-go. Today it carries only tourists, and it is a major attraction in the area. 40+ years ago in the early 1970’s, one of the train’s brakemen had a younger brother that was an avid cyclist, and one day they challenged each other to a train/bike race up the mountain from Durango to Silverton. The cyclist bested his brother on the train, and the Iron Horse Cycling Classic was born. A family get ready for a western photo session. Now the Iron Horse is a huge affair with pro cyclists, recreational riders, volunteers and sponsors of all kinds participating. Their website gives the annual race results for each group of cyclists that competes, but the one thing I couldn’t figure out was: how did the train do?! 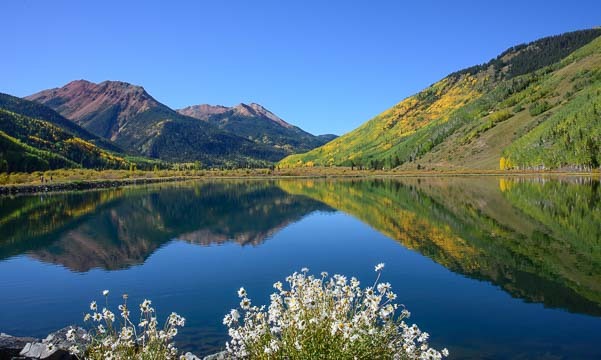 No matter how you get to Silverton, by car, train or bicycle, this town is a great stopover. It’s very photogenic, with colorful old buildings lining the dirt streets that are set against a vivid mountain backdrop. Photographers set up western-themed photo shoots for tourists too, and we watched a family getting set up for a fun photo. There are old mining ruins and old homesteads all over the place. Two little girls donned big flower hats and long dresses, and a little boy hugged a bottle of whiskey while his brothers brandished rifles. Mom had a pistol, and the baby wore chaps. What a hoot! 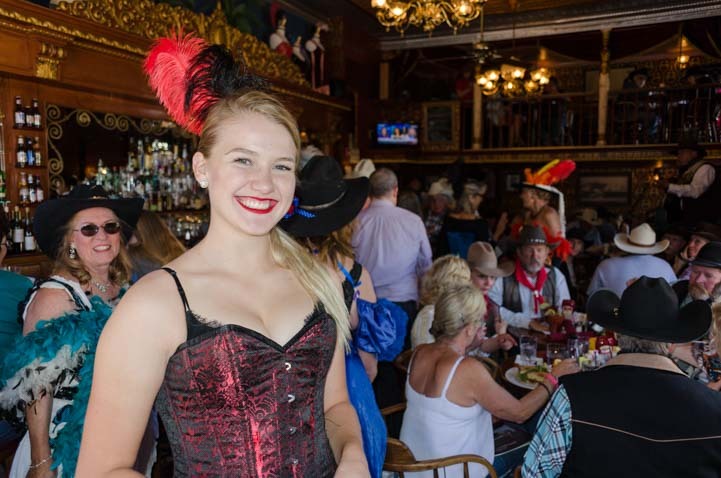 Of course, it’s one thing to dress up like old times and have a meal at one of the western themed restaurants in town. It’s a whole different thing to have lived here in the mining camps 100+ years ago. 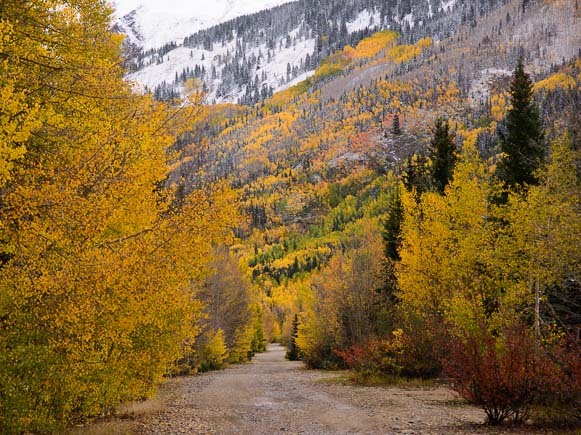 The Million Dollar Highway can be negotiated by the biggest rigs on the highway — if you dare! The ruins of both the mines and the homes are scattered among these mountains, and it is startling to picture that life. 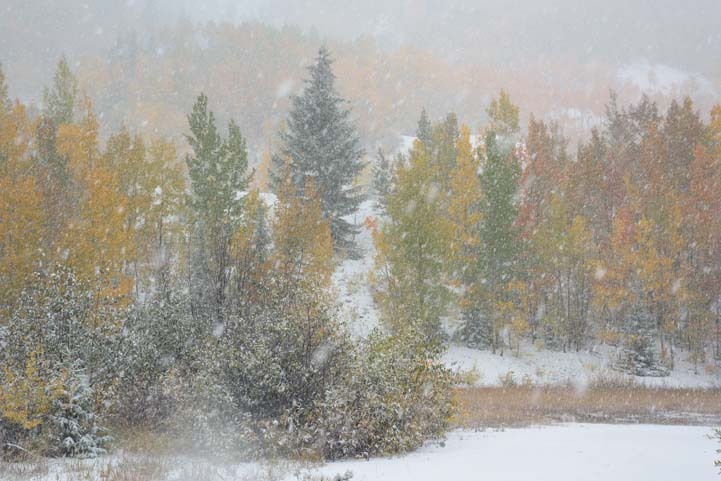 Living at 10,000 feet in remote mountains where snow comes in early October (and sometimes sooner) must have been an unbelievable challenge. What’s worse, the mining companies didn’t care a lick about safety. Falling down a mine shaft or having the whole mine collapse on your head were accepted risks that were just part of the job. In 1918, Silverton was brought to its knees by the influenza epidemic. A staggering 10% of the population died in a six week period. More recently, a rock slide in January, 2014, brought the town to its knees once again. Route 550 was suddenly impassable, and the town was cut off from its main supply route to the north. 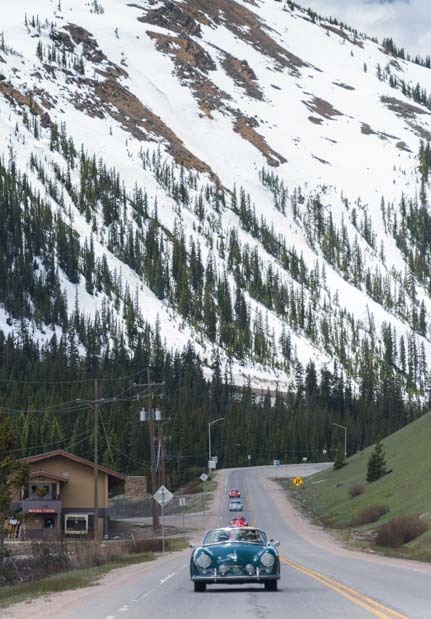 The few vehicles that made it to Silverton had to drive nearly 500 miles out of their way to get there. But hardships of remote mountaintop living aside, it was the gold and silver of yesteryear and the majestic scenery of today that put and keeps this area on the map. For all the grittiness of the mining life in these mountains, I imagine that when the miners found a spare moment to soak in the scenery, it was as precious to them in those days as it is to us today. The scenery here inspired us for weeks. Back out on the road heading back to Ouray, we saw lots of big RVs navigating the hairpin turns on the Million Dollar Highway. 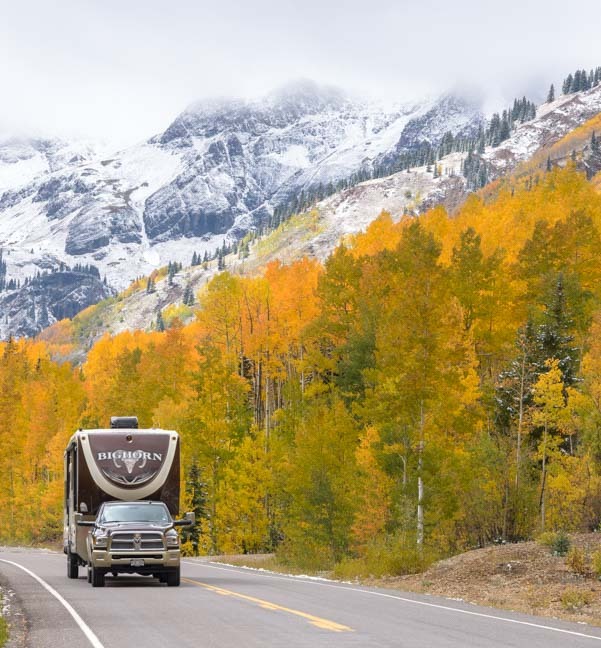 I had looked for info on taking an RV on this road in some of the online RV forums, and lots of people had said there was no way they would ever take a big rig on this road. But many people do it, and we never saw anyone having trouble. Driving it a few times in a smaller vehicle first definitely helps! Prior to towing our 14,000 lb. trailer over these passes, we installed an Edge Evolution Diesel Tuner on our truck to give it a little more power, and it worked great! (Our installation of this engine tuner is described here). 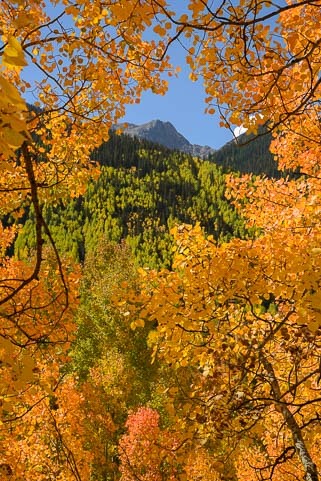 Fall color at Crystal Lake near Ouray. 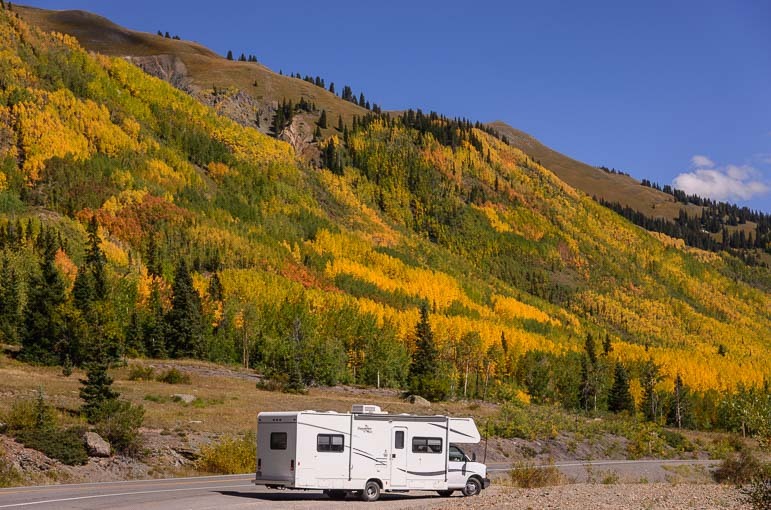 Ouray – Finding the COLOR in Colorado on an RV Trip! 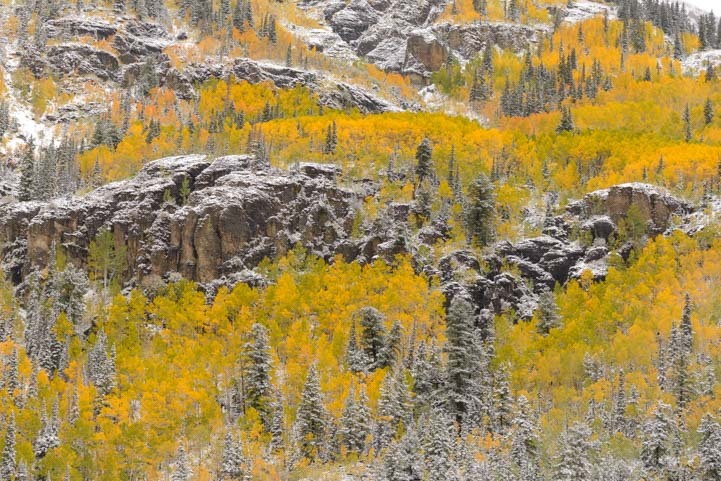 Ouray, Colorado, is a classic western mountain town. 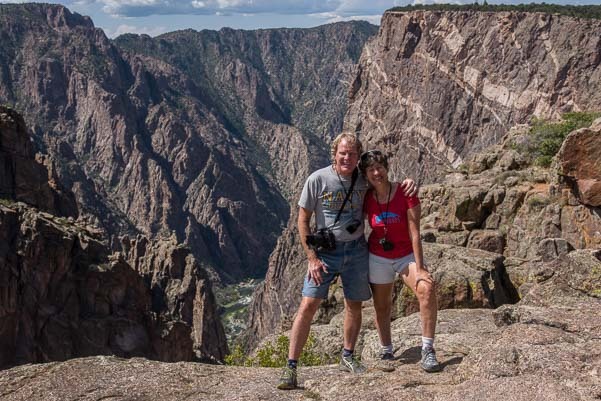 September, 2014 – Continuing our journey south through Colorado, we left the rugged Black Canyon of the Gunnison and traveled on to the classic Rocky Mountain town of Ouray (pronounced “you-ray”). This tiny town of just 1,000 people is tucked into a valley that is nestled in the clouds at nearly 7,800 feet, and it is surrounded on all sides by mountain peaks that soar into the sky. 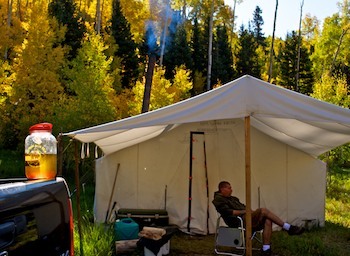 We first discovered Ouray fifteen years prior to this year’s visit on a tent camping trip long before we were RVers. We promptly fell in love with the town and the entire area around it. We hadn’t been back since that first visit, and we were delighted to find that not much has changed. 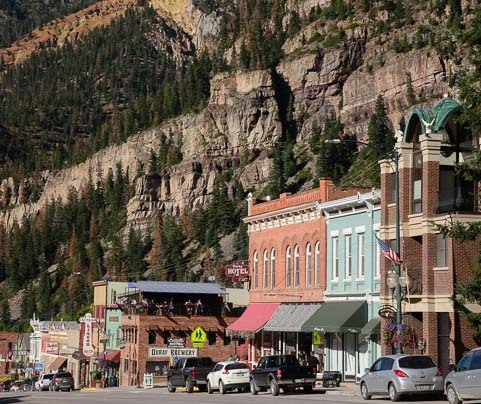 Home to just 1,000 residents, Ouray is a charming mountain town. Even the barista at the cute coffee shop and chocolatier called Mouse’s Chocolates & Coffee confirmed that in the dozen or so years she’d been in town things have remained pretty much as they were. That’s a rare thing in the popular western states, and it’s a good thing there hasn’t been a huge press for growth, because there is absolutely no room for this town to grow. Sheer mountains frame every view in every direction, and the streets on the edges of town turn sharply upward. 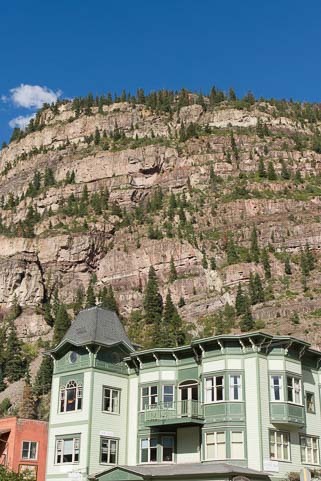 Most of Ouray’s architecture dates to the turn of the last century. 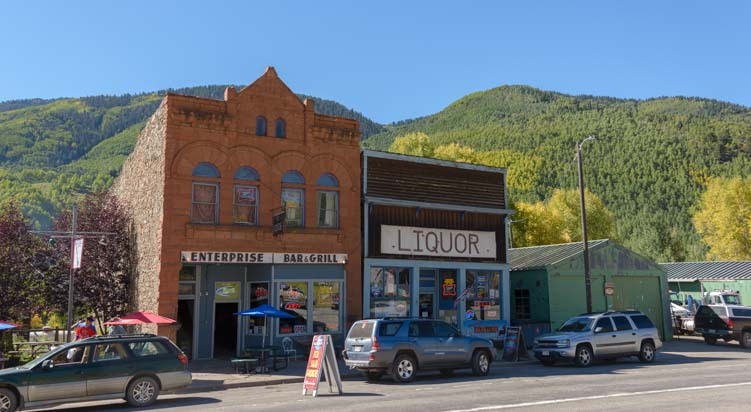 The town fills the whole little valley, and the town’s dirt streets that are away from the main drag are wonderful proof that progress is taking its time here. 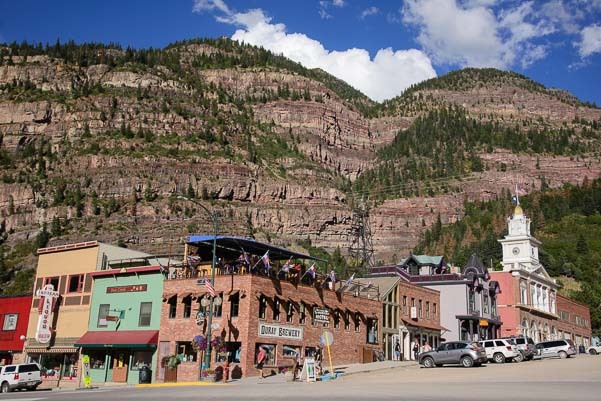 Settled as a base for miners working the thirty or so gold and silver mines in the nearby mountains, Ouray was home 1,000 residents way back in 1877 too. 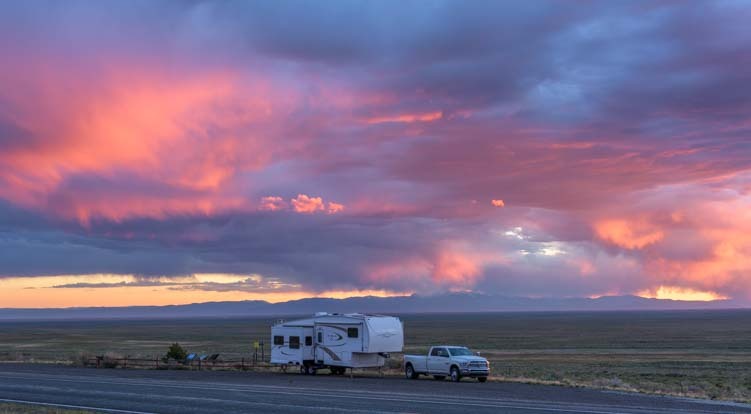 What a place to go RVing! 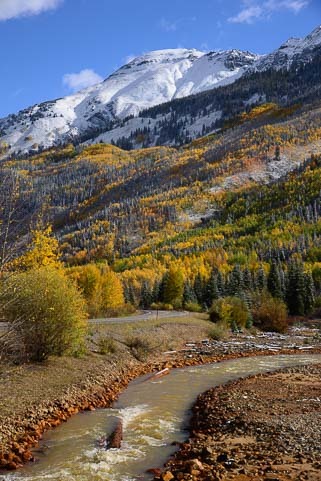 From 1887 until 1930 the Denver & Rio Grande Railway brought people and goods to and from Ridgway 10 miles to the north. Today the town boasts beautiful architecture on the main street with wonderful Victorians dotting the view. 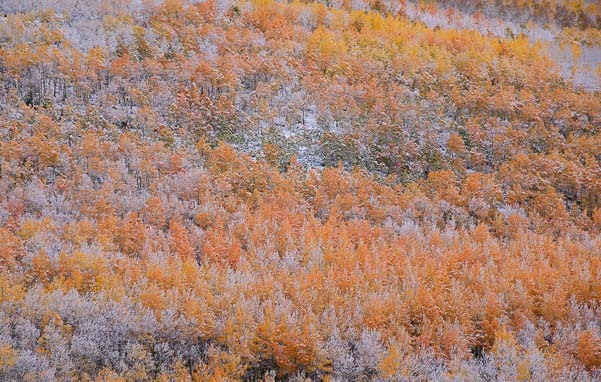 The aspen trees were a brilliant orange. 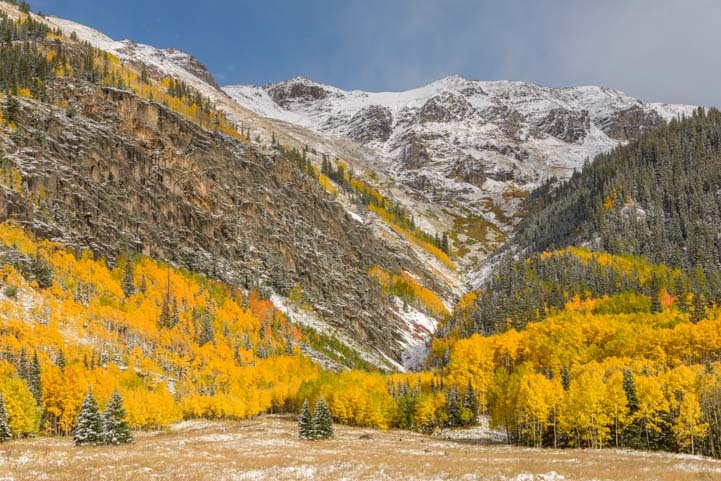 For us and for many fall visitors, the real draw to Ouray, which many call the “Switzerland of the Rockies,” is the stunning visual drama of the fall foliage season. 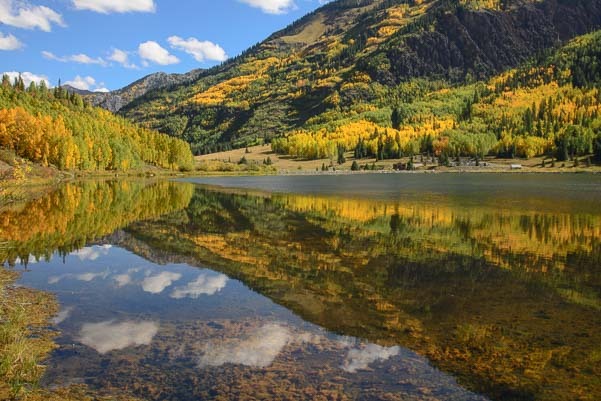 Two years ago we attended a photography workshop in the Ridgway/Telluride area put on by the incomparable Nasim Mansurov of PhotographyLife.com, a massively popular website. 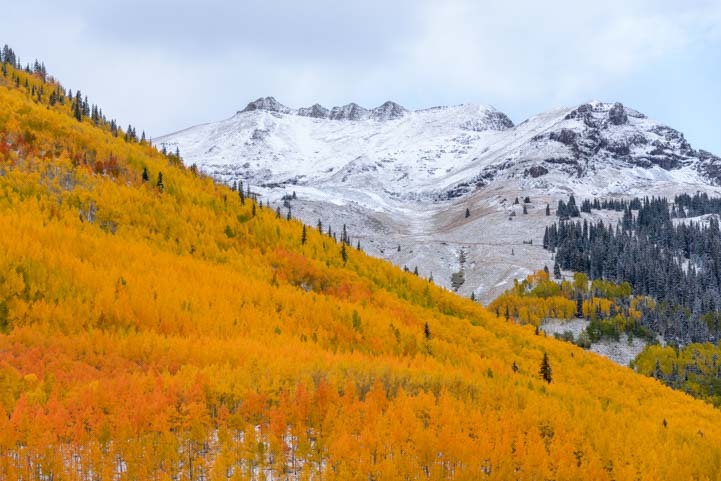 At the workshop we were blown away by the brightly colored aspen that blanketed the mountainsides beneath the gray craggy peaks on the Dallas Divide. Nasim is a very unusual person. Born and raised in Uzbekistan, he is gifted with that special kind of charisma and leadership ability that have ensured him a massive following (in the hundreds of thousands), not just for his photography blog but in past years when he led an online forum dedicated to Central Asian students studying abroad. To see just how unique he is, read his inspiring essay on why he traded a hugely successful corporate career for a simpler life doing what he loves. As you enjoy his eloquent writing, note that English is his second language!. 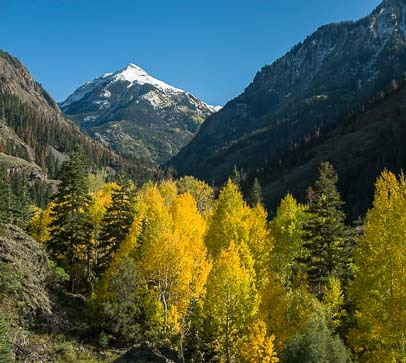 When we discovered he was offering his fall foliage workshop in the Ouray area again this year, we rearranged our travel plans to get us there in plenty of time. Mother Nature did not disappoint. Driving these mountain roads was sheer delight. 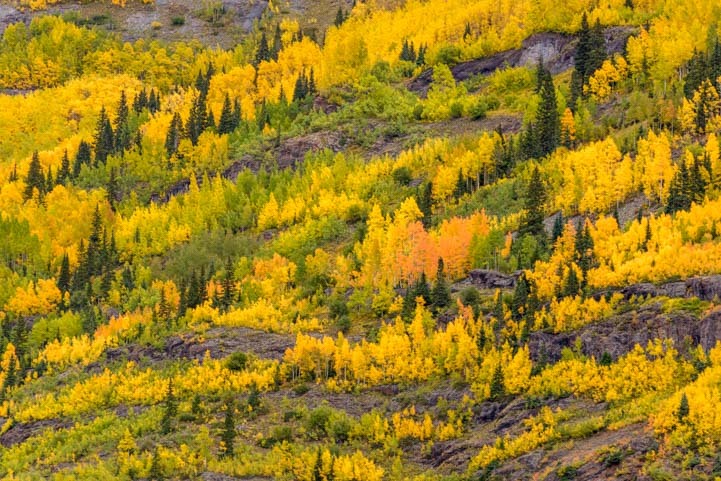 When we arrived in Ouray, the mountains were on fire — not with smoky wildfires but ablaze with the brilliant reds and golds and oranges that transform Colorado’s aspen trees in autumn. 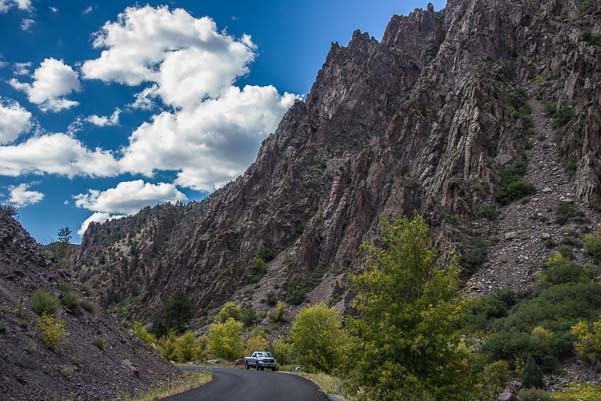 Arriving a few days ahead of time, we eagerly explored the spectacular scenic drive that heads south from town on Route 550. 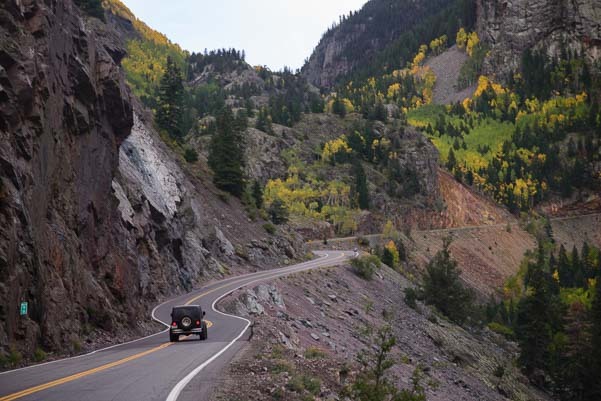 After negotiating a series of incredibly steep 180 degree switchbacks that made us feel like we were driving skyward into a kaleidoscope of yellow and orange, the road skirted some very sheer cliffs and delivered us to Crystal Lake. This small lake was as still as glass in the morning hours, and we circled around the entire body of water, checking out the awe-inspiring views from every vantage point. 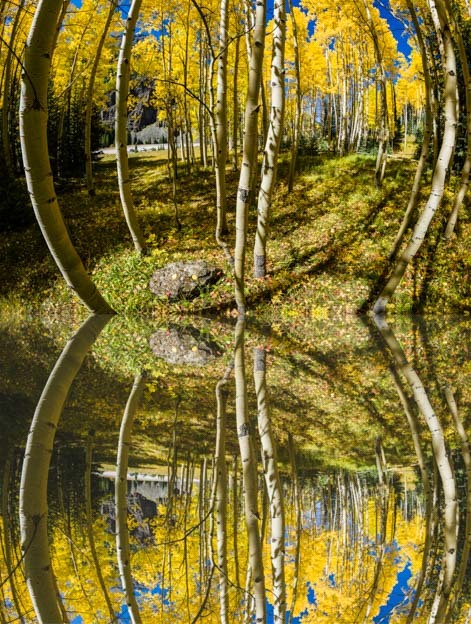 I’ve become very fond of photographing reflected images in mirrored water, and I’ve made the most of the scenes we found in Grand Teton National Park Wyoming and Maroon Bells Colorado. Crystal Lake gave us the same kinds of fun photo ops and totally delighted us both. A few wildflowers were still in bloom at Crystal Lake. The mirror images of the white clouds hovered on the surface of the water while the rocks that were totally visible on the bottom showed their faces through the crystal clear water too. 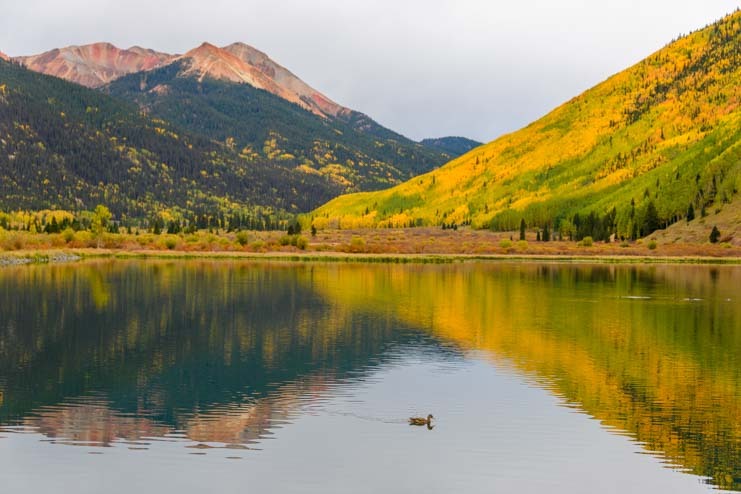 The golden aspens had just started to color the shoreline, and as the weeks went on during our stay, all the hillsides around the lake soon took on a bright yellow and rich orange hue. A few straggling wildflowers were still blooming at the water’s edge. I’m sure if we’d been there a few weeks earlier they would have been even thicker. There is beautiful scenery every way you turn! I got a kick out of getting reflection shots at this lake. 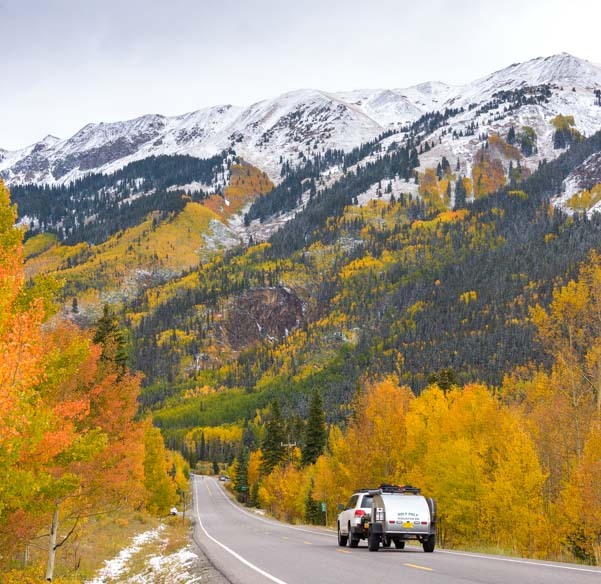 The spectacular fall foliage season in Colorado is hardly an unknown phenomenon, and we found ourselves in plenty of company as we repeatedly drove this jaw-dropping drive over the coming weeks. 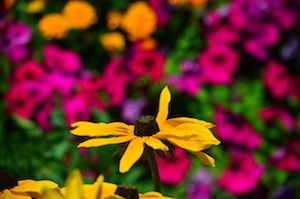 From iPhones held out car windows to photographers with huge cameras and tripods, everyone was out and about taking photos in the abundant sunshine and even more abundant color. As the road climbs into the mountains, taking one tight switchback turn after another, the views into the valleys become ever grander. Is this a “scenic” drive? I think I would call it a “Knock Your Socks Off” drive!! 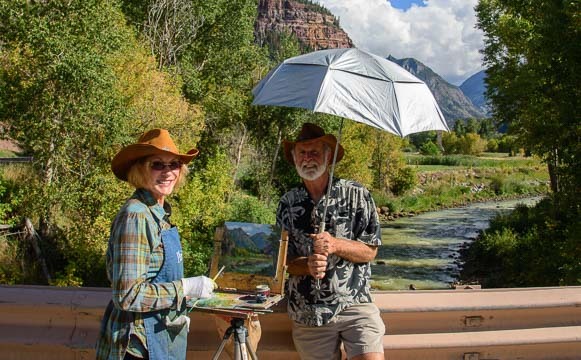 What a gentleman – he shaded his wife with his umbrella while she painted! Not far from town we came across a couple standing on a bridge. I did a double take as we passed because the guy was holding an umbrella. Looking closer, I saw he was holding it over his wife’s head as she painted the river scene in front of her with oil paints and canvas on an easel. It is crazy, but this is something like the fourth or fifth time we have run into “plein aire” artists painting out in nature this year. 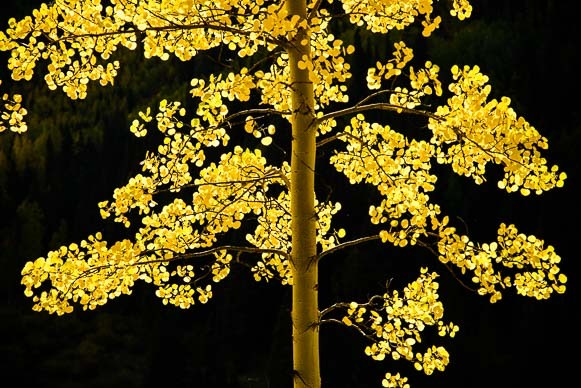 Mark captured this beautiful reverse silhouette of an aspen in autumn. 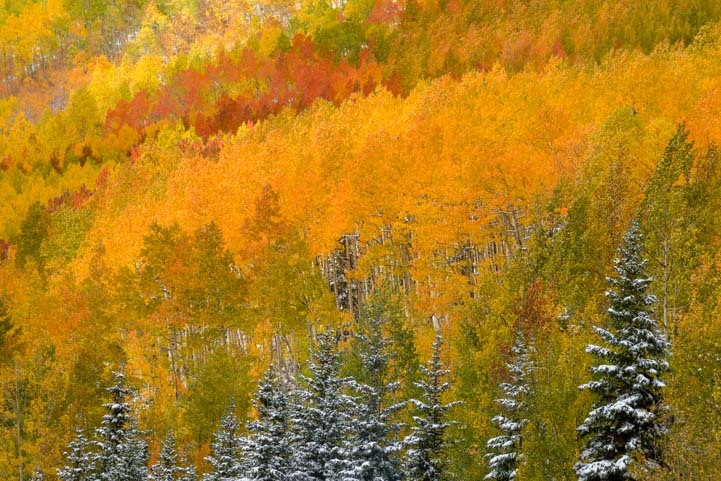 From Phoenix, Arizona to Sun Valley, Idaho, to the Tetons we keep stumbling upon artists happily recreating beautiful landscapes on their easels in nature. I joked with the woman that she had found herself a very special husband if he would willingly stand next to her and hold an umbrella over her for hours on end, keeping her shaded while she painted. And he didn’t seem to mind one bit. A perfect still-life was all set up for me here. 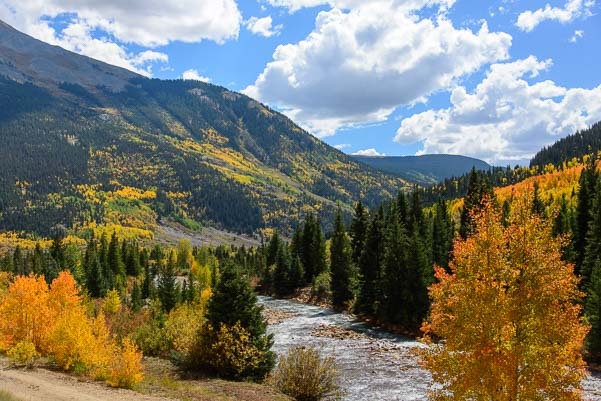 The fall colors in Colorado can easily awaken the most artistic feelings in even the least sensitive soul, and we got caught up in the excitement of Nature’s vivid display along with everyone else. Cars were pulled over at one hundred yard intervals for miles along the highway, and we scampered around the meadows with all the others, scoping out one magical scene after another. 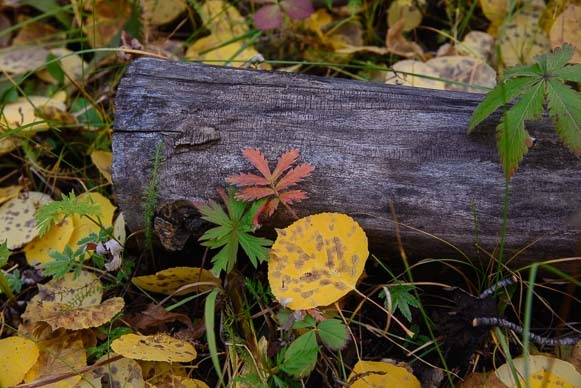 Mark created a beautiful image of an aspen reverse-silhouetted against blackness, and I found the most amazing ready-made still-life with colorful leaves lying on a log. I didn’t put any of it in place there, honest! The scenery was so majestic it was intoxicating. 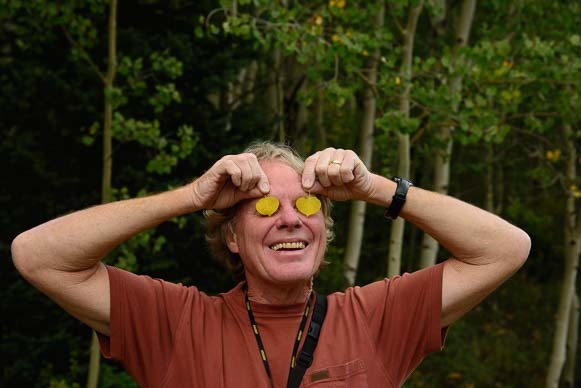 Caught up in the thrill, Mark suddenly grabbed two aspen leaves and held them over his eyes. “Take my picture!” He said. I laughed as I got his pic. What a goof-ball. But that’s the kind of silliness and joy this place inspires at this time of year! 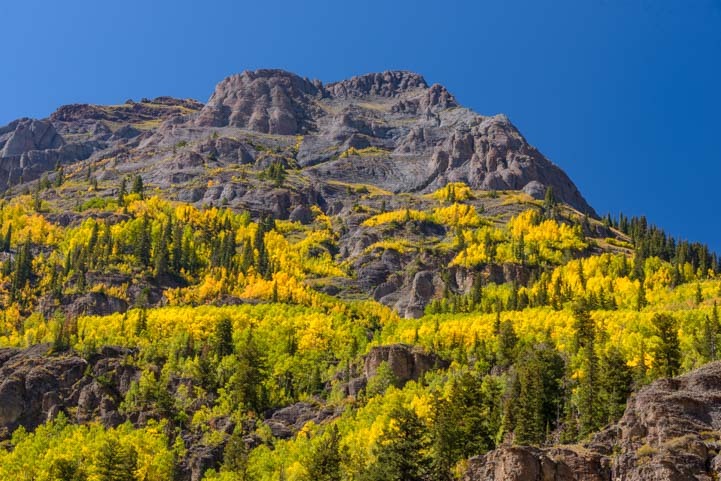 Ouray is a gorgeous place to visit in late September and early October. The host “hotel” for the PhotographyLife.com fall foliage photography workshop this year was the KOA campground in Ouray. 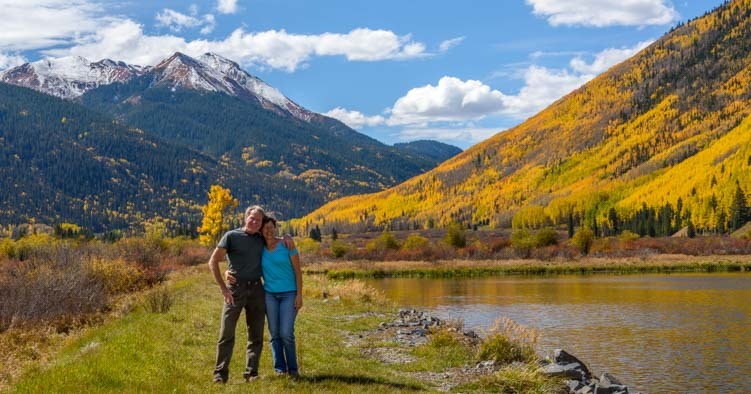 Nasim and his wife Lola are enthusiastic RVers, and they set up camp with their young family in their beautiful new 38′ Cougar fifth wheel trailer. Other attendees came in assorted RVs, and many stayed in the KOA camping cabins as well. The campground common room was quickly transformed into a lecture and seminar room, and people loaded down with eye popping photography gear of all kinds began to assemble. The weather in the mountains at this time of year is very unpredictable, and Nasim deftly got everyone out onto the spectacular forest roads in the area when the sun was shining and brought the group back indoors for lectures when it rained. The mottled skies made for some beautiful photo ops, and no matter how many times we drove in and out of town or up and down the forest roads, our eyes were riveted on the gorgeous scenes all around us. 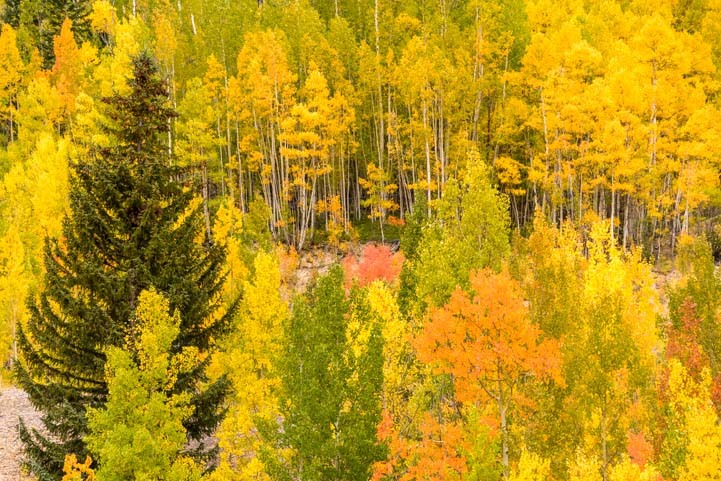 The trees seemed to change even as you looked at them, fading from lime green to the lemon yellow and darkening from yellow to a rich orange hue as the hours and days passed. 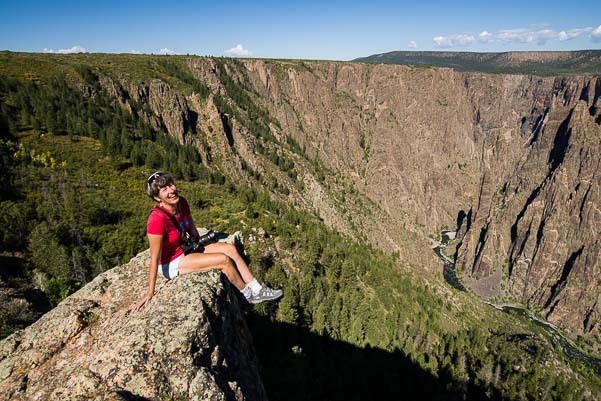 Black Canyon of the Gunnison National Park, CO – Steep and Deep! 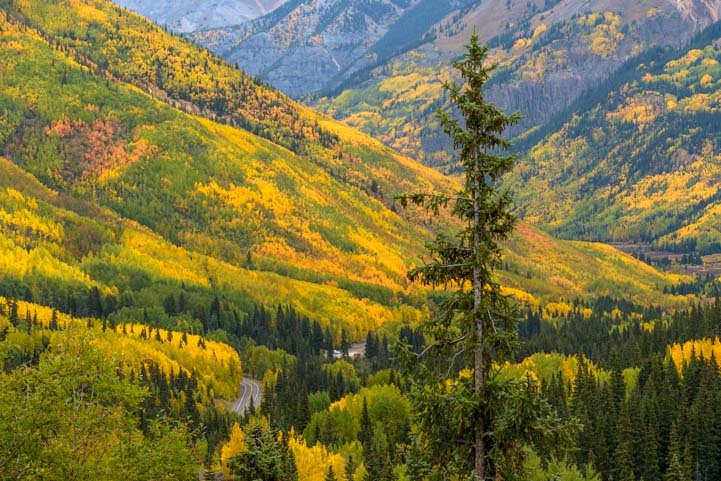 September, 2014 – Maroon Bells may be the most photographed spot in Colorado’s Rocky Mountains, but nearby Castle Creek Road is also very scenic and not nearly as heavily visited. 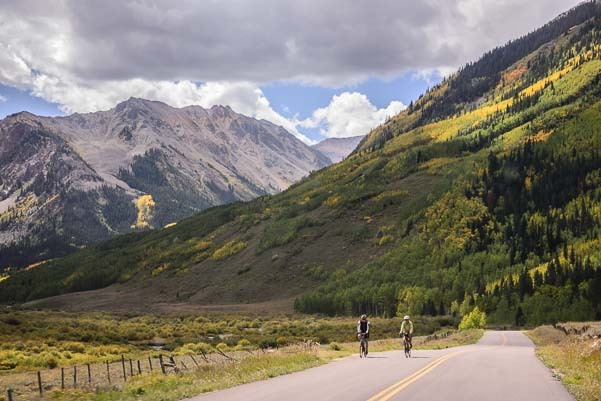 We drove out one day and passed a steady stream of cyclists enjoying an exhilarating road ride. What a place for a morning workout! 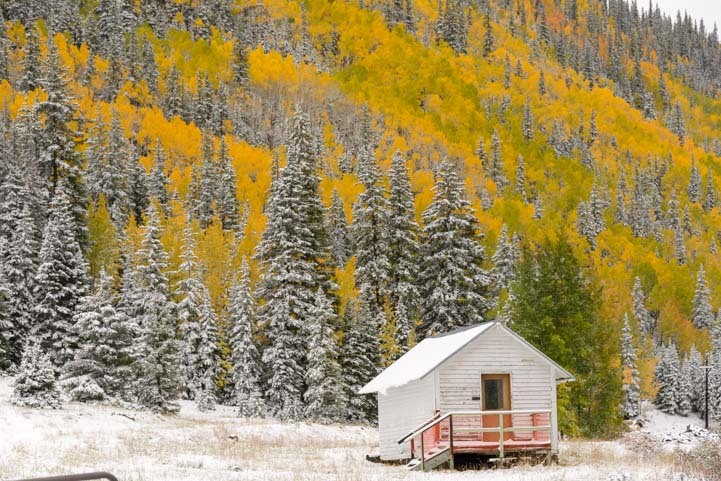 A tiny historic ghost town named Ashcroft lies at the end of the road. The old buildings were interesting, but we were more intrigued by a row of colorful rugs we saw hanging outside a shop very close by. 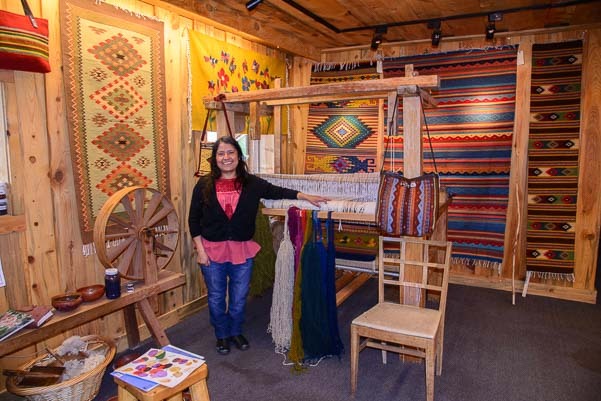 The rug weavers of Oaxaca come to Colorado! We walked past the many rugs, admiring their designs, and then stepped inside. We were suddenly surrounded by woven wool rugs that looked very similar to the ones we had seen near Oaxaca at Teotitlán de Valle in Mexico a few years ago. A friendly looking woman was giving a demonstration to several tourists, showing them how the blue dyes were derived from indigo. Our jaws dropped. That was exactly the same demonstration that we had seen in Teotitlán de Valle! It turned out that this woman came from a family of rug weavers in that very same Mexican village. I remembered vividly how our tour guide in Oaxaca had squished a bug in the palm of a girl’s hand to demonstrate how they made their red dyes (see my blog post about it here). Apparently, the owner of this shop’s building had brought a few Oaxacan weavers to Colorado to promote their craft each summer. How fun! 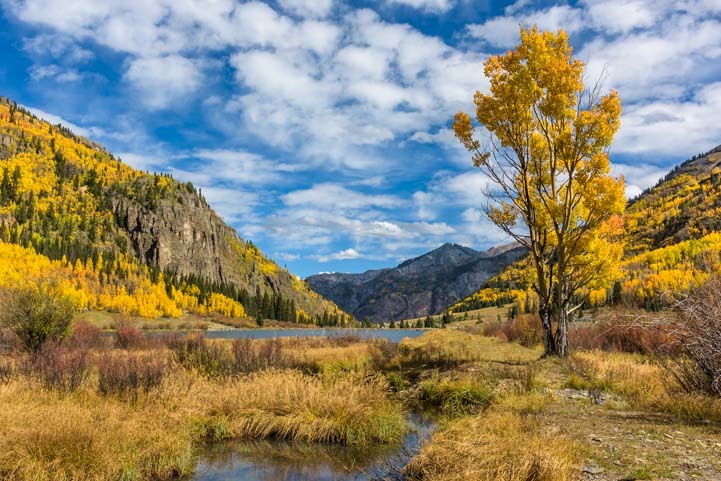 Where Maroon Bells and Castle Creek had shown us Colorado’s Rocky Mountains in the early stages of their fall glory, another land of stunning scenery — Black Canyon of the Gunnison — beckoned. This canyon’s jagged cliffs are nothing like the soaring Rocky mountains. 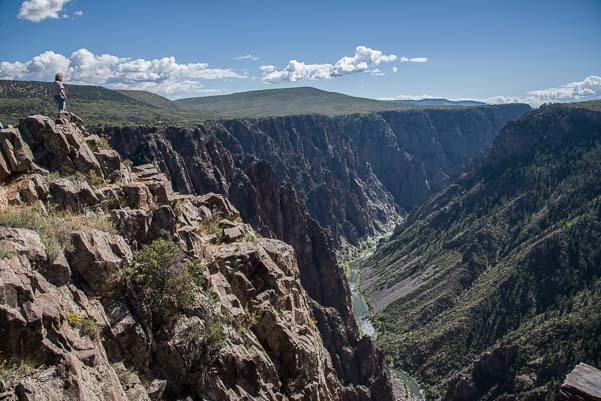 Instead of craning our necks to look up at tall mountain peaks, the Black Canyon of the Gunnison is like a massive crack in the earth’s surface, with the sides parted to reveal sheer rock walls plunging nearly straight down to a thin ribbon of river far below. The canyon wasn’t formed by the walls cracking apart, however. 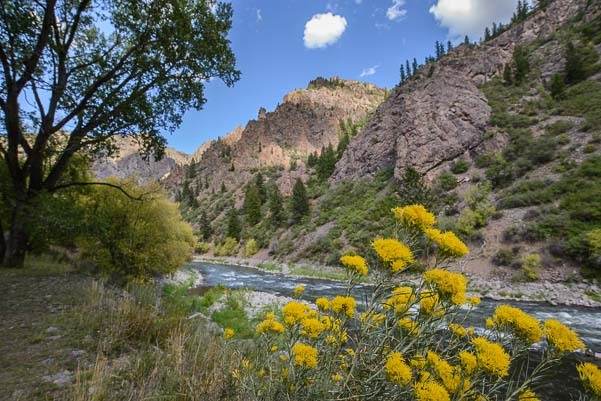 It was formed by the very fast moving Gunnison River cutting through the rock like knife. 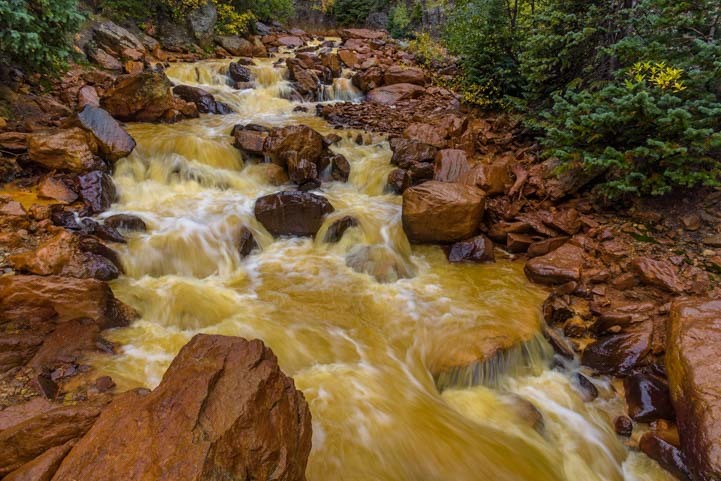 The Gunnison River falls from great heights to great depths, dropping an average of 95 feet per mile. This keeps the water moving at quite a clip. This raging water has cut through the black rock like a laser, deepening the canyon faster than other kinds of erosion can widen it. The canyon is steep and deep! At its narrowest point, it is just ¼ mile across, and the depths of the sheer walls range from 1,750 to 2,700 feet (by comparison, the Empire State Building is 1,454′ feet tall and would reach just partway up the walls!). 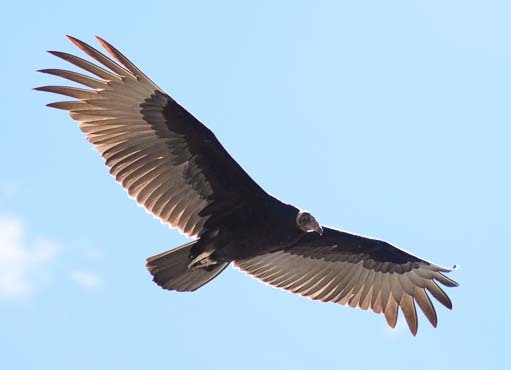 As we approached the rim at an overlook, we saw several turkey vultures circling right overhead. They played with the air currents and dove down into the canyon and rose back out again effortlessly. What a thrill it would be to fly like that, letting the earth fall away from under you as you flew over the rim of the canyon! 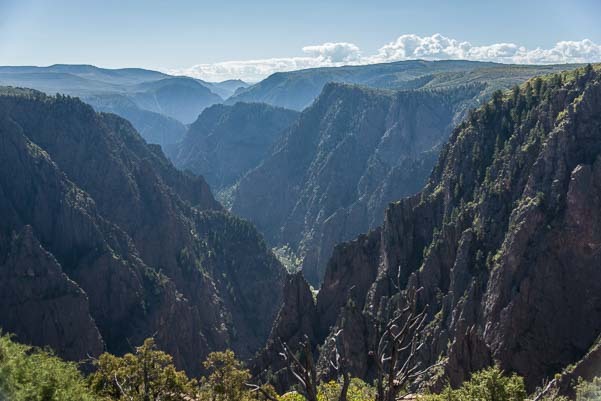 The Black Canyon of the Gunnison fills a huge area along the Gunnison River, and there are two wonderful areas for exploring it: a National Park with an entrance on the south rim and a gorgeous scenic drive that snakes along Route 92 on the north rim. I got a kick out of crawling around on the ledges. At the Visitors Center for the Black Canyon of the Gunnison National Park we noticed a bulletin board covered with little hand written notes. “Happy Birthday, Wilderness!” a sign said, recognizing 2014 as the 50th anniversary of the Wilderness Act. The “Painted Wall” is one of the most stunning overlooks. Beneath the sign was a quote from Edward Abbey, novelist, environmentalist, and critic of public land policies. “Wilderness is not a luxury but a necessity to the human spirit,” he was quoted as saying. “Free & Wild!” penned one person, adding a smiley face for emphasis. What a great place to explore! “A place to discover who/what you are made of/for/by” responded another with a little red heart. I got a kick out of reading these notes. 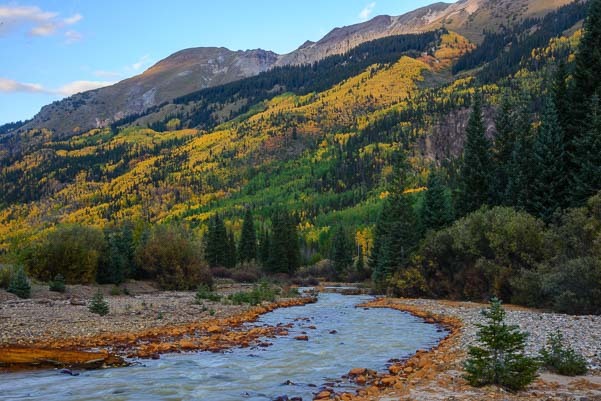 In hindsight, it is especially interesting to read them now in light of the recent public outcry against restricting commercial filming in officially designated Wilderness Areas. To get a feeling for the scale of the place, here’s our truck dwarfed by the peaks! “Wilderness speaks…to my soul,” one card said. Wildnerness is “one place in the world where man is insignificant and always will be,” another proclaimed. 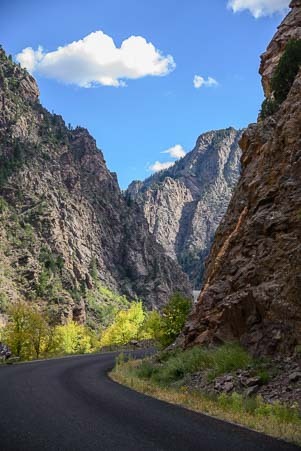 Yet, back in 1881-82, over 1,000 immigrants from Italy and Ireland worked in horrible conditions full of rock slides, avalanches, and unreliable explosives to push the Rio Grande narrow gauge railroad through this canyon. It is hard to imagine the harsh working environment these men endured, sleeping and eating in wooden work cars and bedding down on wooden planks. We drove along the Gunnison River at the bottom of the canyon. Staring down into the canyon from the overlooks that have been carefully designed and built by the National Park Service, it is even harder to imagine the raw triumph these men must have felt when the first train puffed its way through the canyon. The trains and railroad had defeated the wilderness at last. This railway was touted as the “Scenic Line of the World,” and the trains carried thousands of people and tons of goods and livestock through the canyon. “Wilderness is my heaven,” says one of the cards at the Visitors Center. “What a Creator we have! Praise His name!” says another. 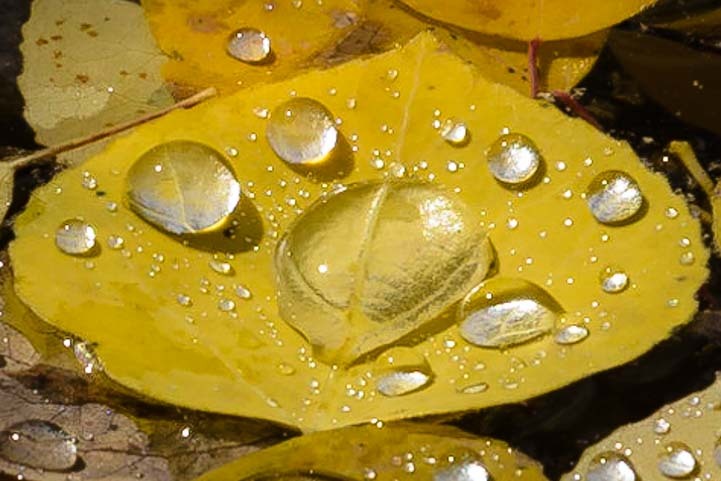 The sun played on the leaves of the trees as they reflected in the water. 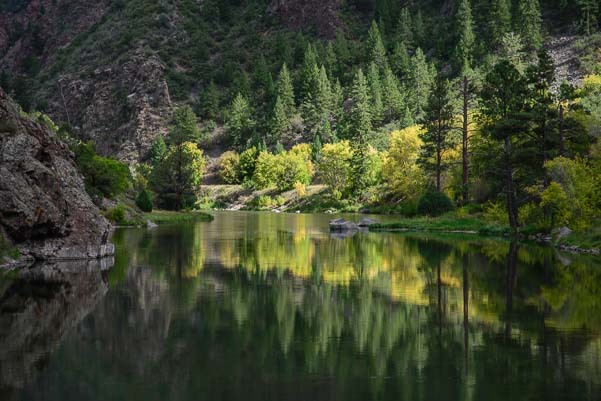 Down at the base of the canyon along the Gunnison River, the sun played with the green leaves of the trees and their reflections in the placid water. Finding that delicate balance between our urge to conquer and make use of our most beautiful landscapes and our urge to protect them and leave them alone has challenged our leaders and thinkers for nearly two centuries. Mark and I both read the Autobiography of Ansel Adams and were astonished to learn just how hotly the mission of the National Park Service and other public land agencies were debated in the early 1900’s. 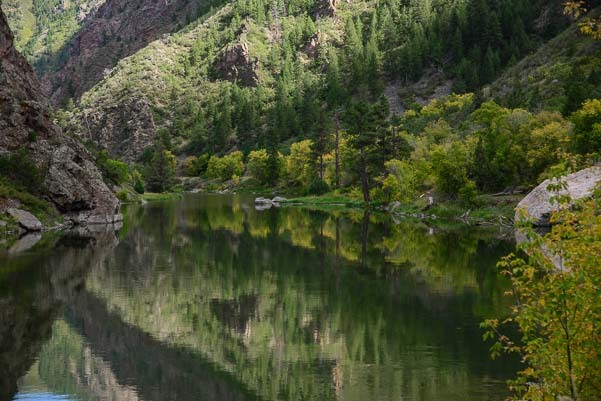 Mirror images in the Gunnison River. We think of Adams as a photographer, but he was deeply involved in the early development of the Sierra Club, and he had very strong opinions about the National Park Service, most of them far from flattering. He was fortunate to see these lands at their most untouched, and he felt that in many ways he was documenting a disappearing landscape. Of course, he was not nearly as comfortable in his tent in the early decades of the 1900’s as we are running around in our luxury fifth wheel today. And that is the deepest irony of what “wilderness” really means. At the river’s edge in the bottom of the canyon. To make wild landscapes easily accessible requires roads, railways and other development. That gives us laymen a chance to get inside the scenery and enjoy the beauty. But the very presence of those developments changes the landscape forever. The “wild” in “wilderness” springs from its very inaccessibility. The more accessible it becomes, the less wild it can be, by definition. 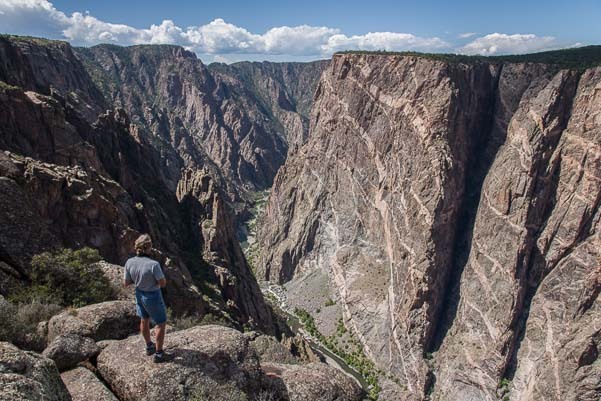 Even though much of the Black Canyon of the Gunnison is officially a Wilderness Area, much of it has also been tamed. 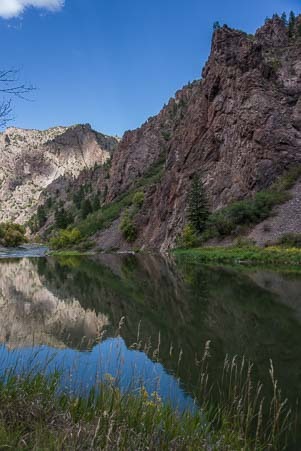 Curecanti National Recreation Area (Blue Mesa Reservoir) is at the east end of the Black Canyon of the Gunnison. 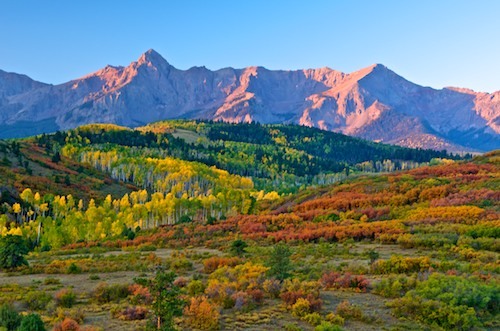 “Earth untouched by man,” is what ‘wilderness’ means to one person who answered the ranger’s query with a card on the wall at the Visitors Center. Yet that very description is a dream and a fantasy for all but the most intrepid trekkers among us. 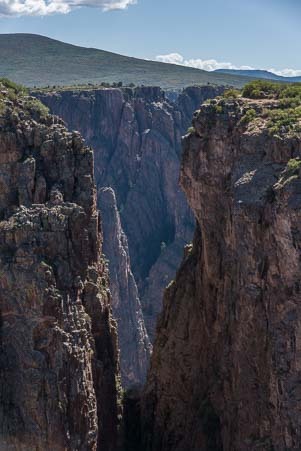 That kind of wilderness certainly isn’t a place you can drive by in a heated or air conditioned car, like the beautiful overlooks at the Black Canyon that are the only parts of it most of us will ever reach. 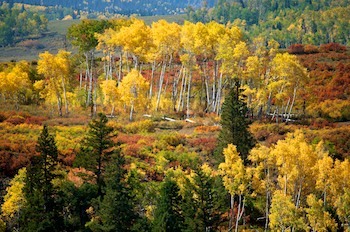 The nearby Gunnison Gorge Wilderness Area. 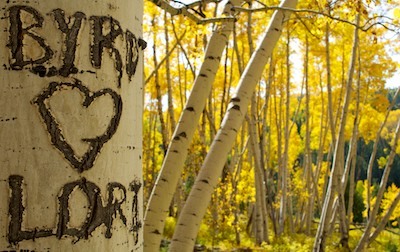 Romance at Maroon Bells Colorado! 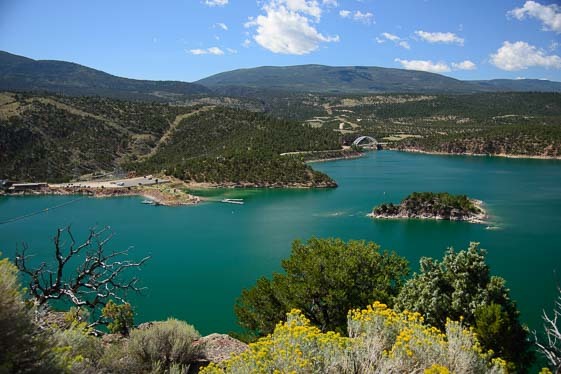 We waved “Hello” and “Goodbye” to the vivid Green River at Flaming Gorge. Grand Teton National Park turned out to be our northernmost stop in our RV travels this summer, and at the end of our second week a cold spell swept through. It was time to move on — and move south. 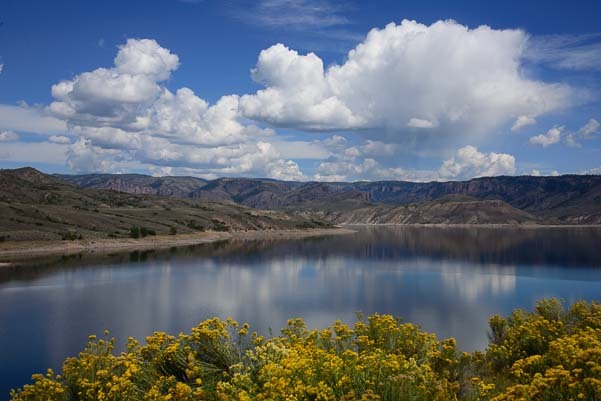 We traveled down through Jackson and Pinedale Wyoming and continued onwards south past the stunning Flaming Gorge National Recreation Area that straddles Wyoming and Utah. We have spent a lot of time there in the past, so we just waved at the brilliant Green River, scooted by, and kept on going. Photo workshop students line up for the sunrise shot. 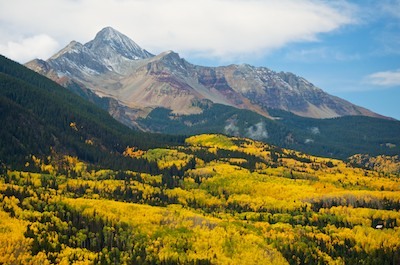 Late September, 2012 – We went to Ridgway, Colorado, for a landscape photography workshop, and the Colorado Rockies were bursting with fall foliage colors when we arrived. The rising sun lights up our view. 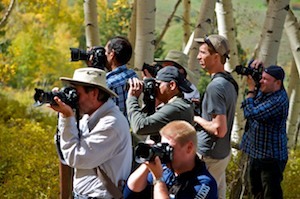 Our group of 20 or so photography enthusiasts gathered at Ridgway Lodge the night before the big shoot to review our camera equipment and basic photography techniques. My, oh my, I have never seen so many top-of-the-line Nikon cameras in one room. The next morning, before dawn, we all piled into four cars and set off for our first shooting locale. 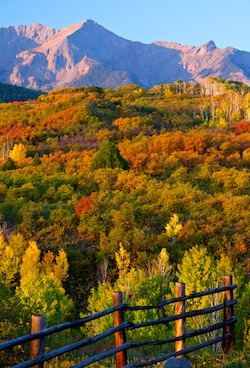 A scenic overlook along Route 62 heading to Telluride is a favorite among photographers, and we all lined up in front of a fence to get shots of the rising sun as it cast its pink and golden light across the colorful foothills leading to the San Juan mountains. 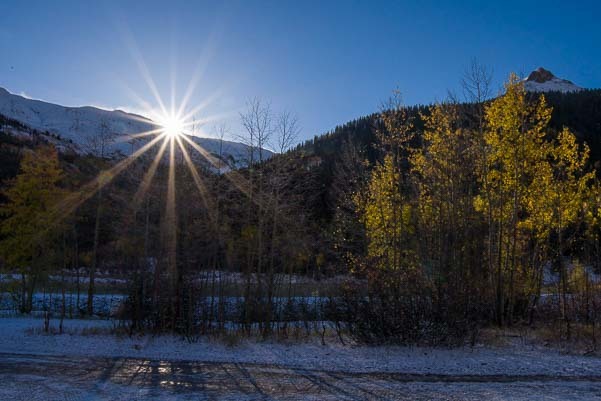 Sunrise at the San Juan mountains. Our instructor, Nasim Mansurov, gave marching orders for how to set up our cameras for this shot. He wanted us to shoot in manual mode, something Mark understands but that I’d never done before. His instructions were spot on, and as the landscape before us came to life, the images on our cameras miraculously did too. 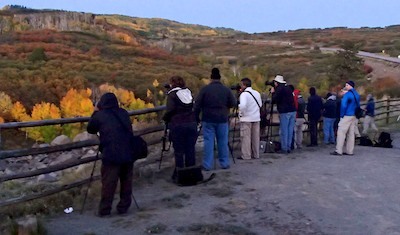 How funny it was, though, to stand shoulder to shoulder with other photography buffs in the pre-dawn light, waiting for the magic to happen in front of us!! As we progressed from one shooting location to the next, Nasim explained the importance of using “leading lines” in our photos to draw our viewers’ eyes into our pictures. “If you go to Rome or Egypt you’ll see that the ancient architects used leading lines everywhere,” he told us. 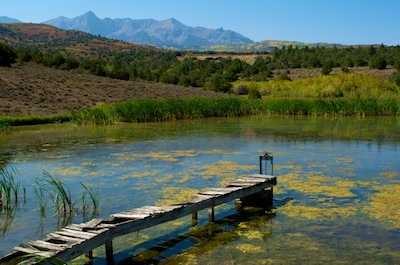 At a small pond along Dallas Creek Road, he explained that the pier could be used to create a leading line coming in from the lower left corner of the photo. Suddenly all the cameras pointed that way to try to get the shot he described. We learned about using “leading lines” in our photos. We stopped again, trying this time to incorporate an old, crooked, wooden fence into our images. 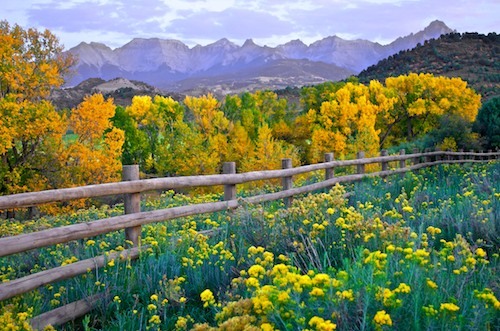 Nasim explained that the fence in the foreground would lead to the golden aspen in the mid-ground and then to the craggy mountains in the background. Neither Mark nor I were happy with our results, but an elk hunter who was watching all of us crazy photographers crawling all over the wooden fence got a chuckle out of the scene. A hunter tells me of a celebrity wedding on Ralph Lauren’s property. The hunter and I began chatting and he told me that at this time last year Jeb Bush’s son and Ralph Lauren’s daughter had gotten married on Lauren’s massive estate (he owns most of the stunning land in this area). What an event that must have been, with Secret Service protecting two former presidents, and helicopters bringing in celebrities from all over. Apparently all the national forest roads were blocked off for several days, annoying more than a few hunters and campers who were stuck on one side or the other! Isn’t it ancient wisdom that if you’re gonna throw a big noisy party you gotta invite all your neighbors??!! 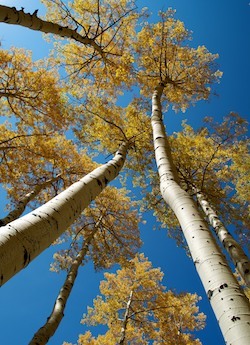 The aspen get paparazzi treatment! When we came to an unusual canopy of aspen trees shrouding a section of Last Dollar Road, Nasim asked us all to hold back before we walked in among the trees so we wouldn’t get in each other’s photos. This made for a funny paparazzi crowd at the entrance to the aspen grove. 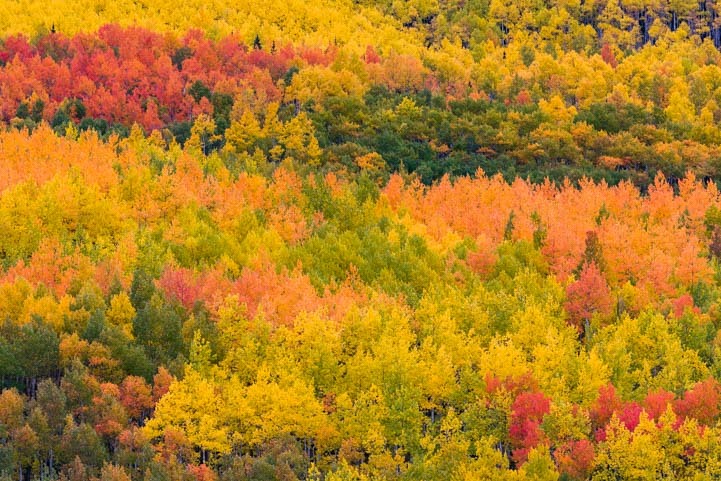 Those aspens were getting celebrity treatment worthy of Ralph Lauren himself!! 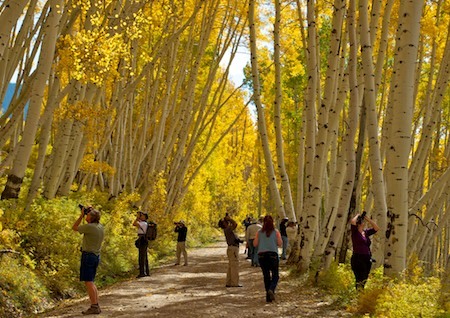 Photography students roam around under the canopy of aspen. 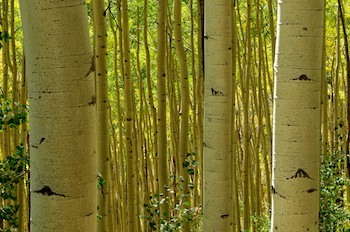 After a few moments we all wandered into the stand of aspens and let our cameras loose. What a blast! Mark and I were lucky enough to be passengers in Nasim’s station wagon for the entire workshop, so we were privy to some lively exchanges between him and the other very knowledgeable folks in the car about the merits of all kinds of gear and various photography techniques and tricks. 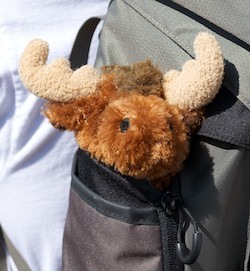 A mascot comes along for the ride. We heard about polarizing filters, graduated neutral density filters, and the quality of this lens versus that. We chatted about figuring out an image’s hyperfocal length and dividing an image’s composition into thirds. The discussions were fast and furious. For us, it was an intense immersion into a new, exciting world. When the day began to wind down, we stopped for a sunset shot looking back across fields of hay bales towards the mountains. Unfortunately, the sky didn’t cooperate with magical colors, and many of us had worn out our shutter fingers by then and reached the point of saying, “No more! !” But Mark was still going strong, and he took one of my favorites shots for the whole day of a fence tucked snugly into a field of wildflowers. Folks had flown in from all over the country, and some didn’t have to leave for another day or two, so an impromptu group gathered to take more photos the next day. But the weather was deteriorating rapidly, and the crisp blue skies gave way to clouds and rain. When we finally left the area, a heavy rain had fallen overnight, which blessed us with a sprinkling of snow on mountains. 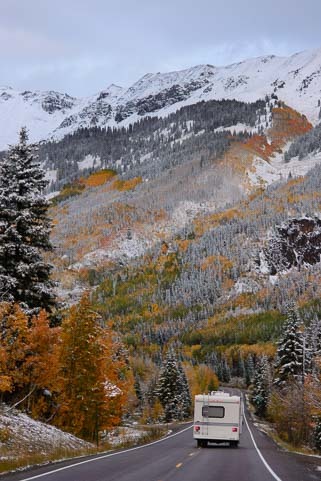 What a glorious drive from Telluride towards Dolores! 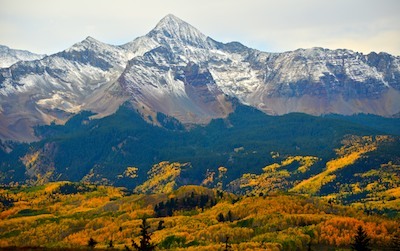 Our drive from Telluride southwest to Dolores was among the most beautiful I have ever seen. 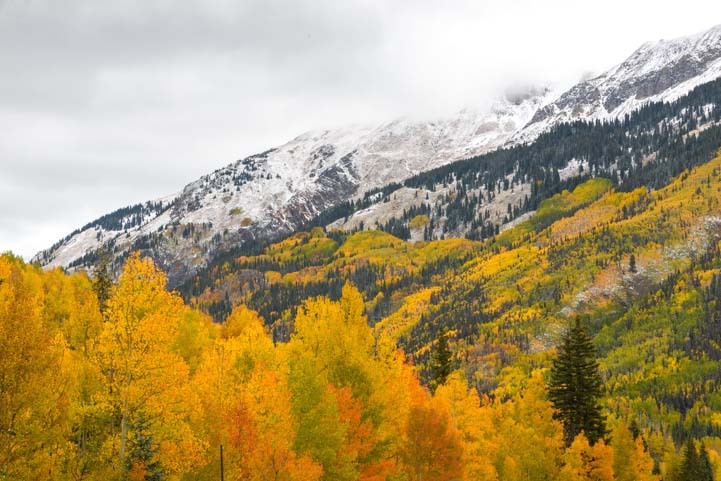 The aspens were rich in color and heavy with moisture, and the skies seemed to be brooding about the coming winter. Majestic scenery in every direction. 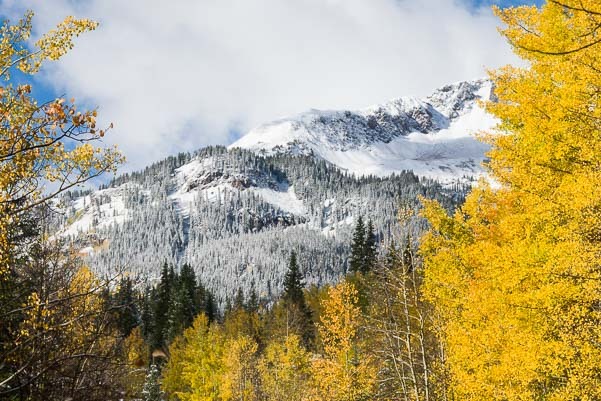 The aspens filled in the valleys with a vivid tapestry of green and yellow, and when I caught Mark smiling beside the edge of the road at one point, it seemed like he was standing in front of a painting. The views continued to inspire us as our buggy sashayed along the twisting mountain roads through the mountains. We stopped briefly at Lizard Head Pass and again in the tiny hamlet of Rico, shivering in the growing cold and sharing the exquisite views with all the other lookie-loos who’d gathered in the scenic pullouts alongside us, cameras and grins flashing. The misty mountains got a little blue sky. Finally, and sadly, the postcard landscape eventually came to an end. 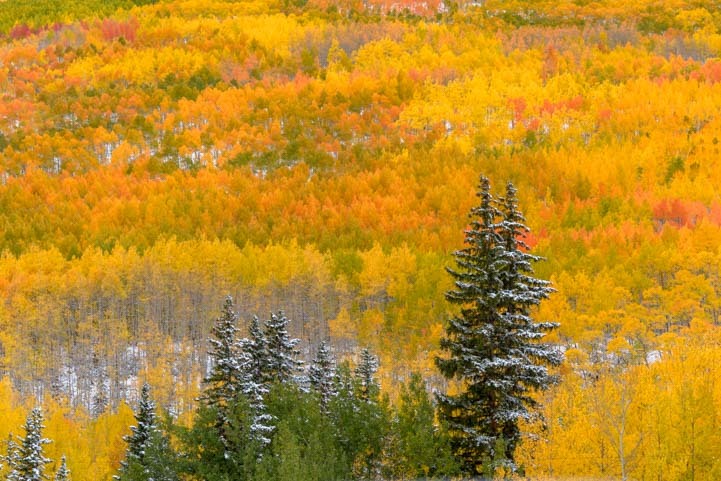 We had been treated to a glorious stay in this gorgeous part of Colorado at the most colorful time of year. As we dropped south out of the mountains into more mundane scenery, the brilliant images we had left behind became a blur in our memories. 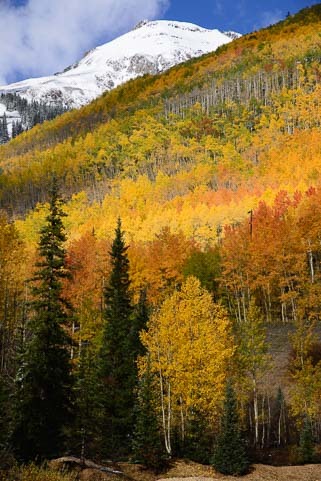 Rico, Colorado – near the end of this magical drive. Of course, our next stop in New Mexico’s Bisti Badlands was pretty exotic too, and it capped off one of our best summers in our trailer!